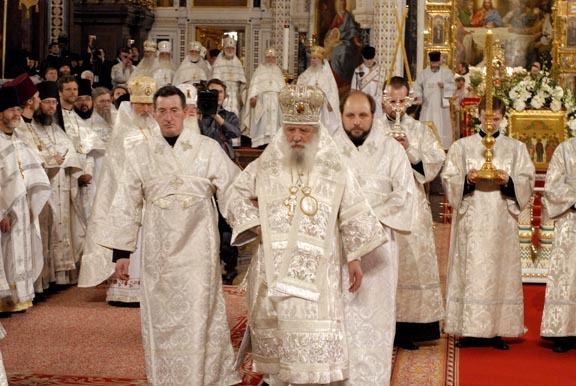 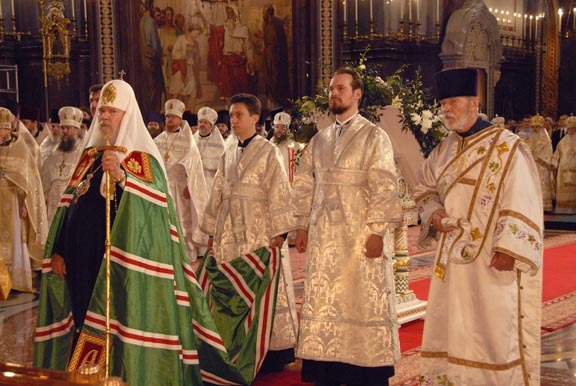 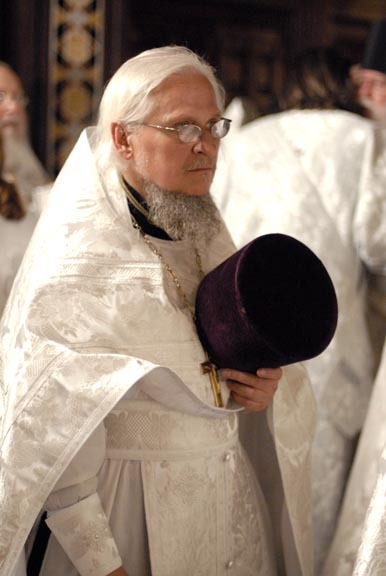 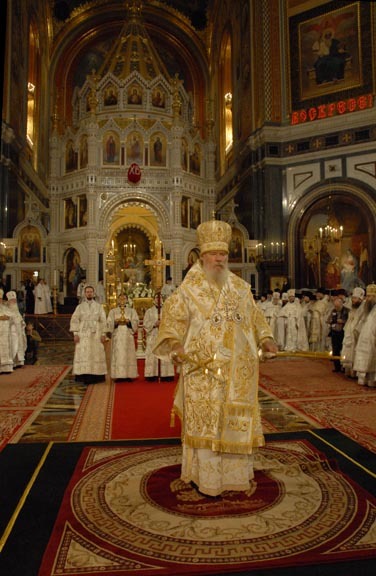 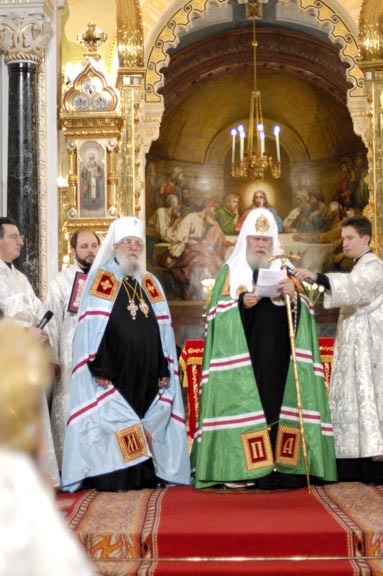 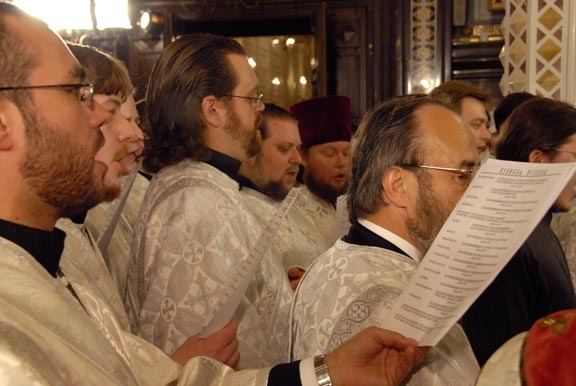 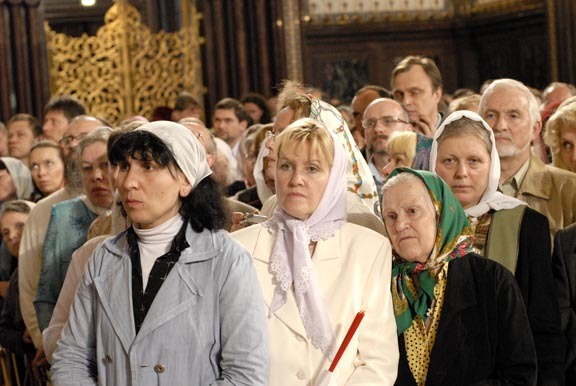 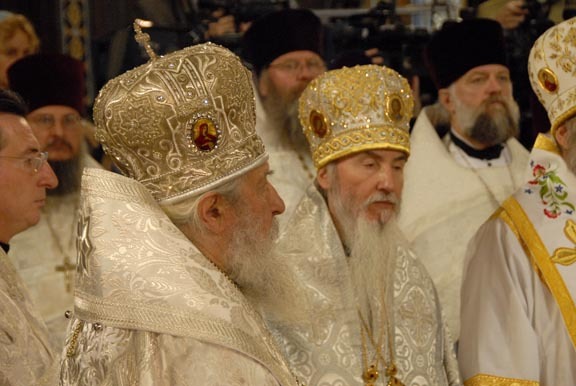 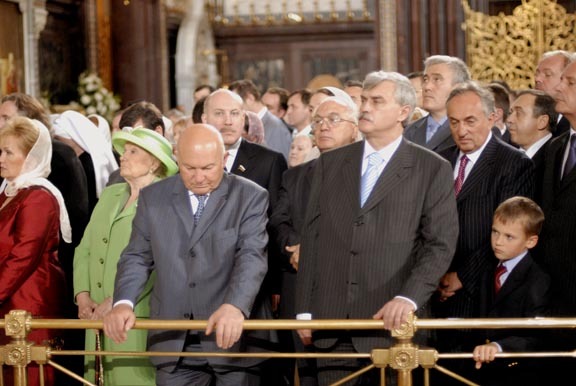 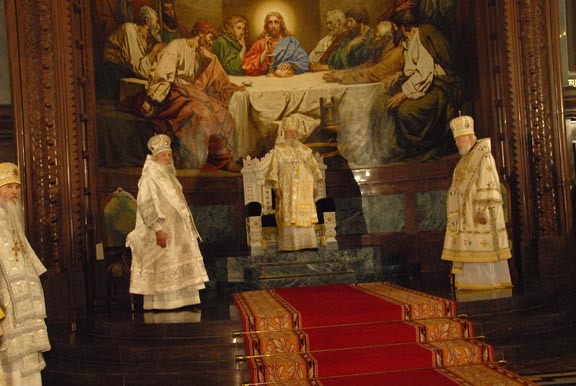 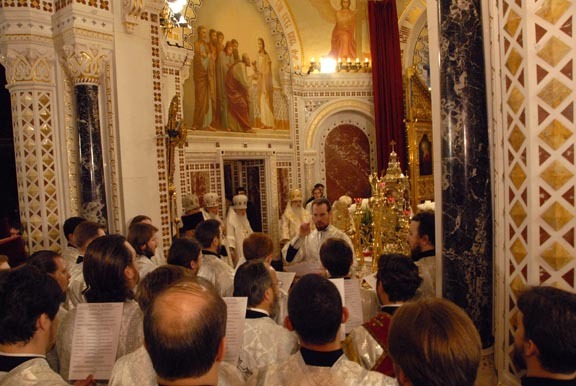 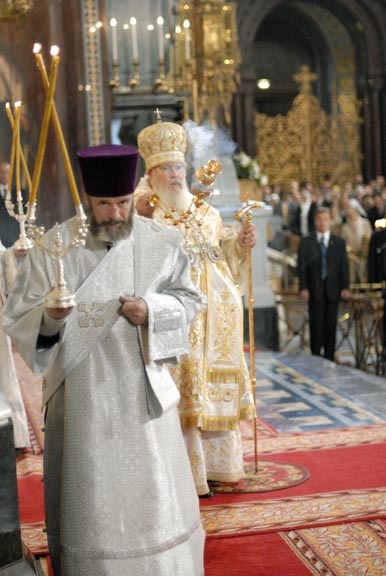 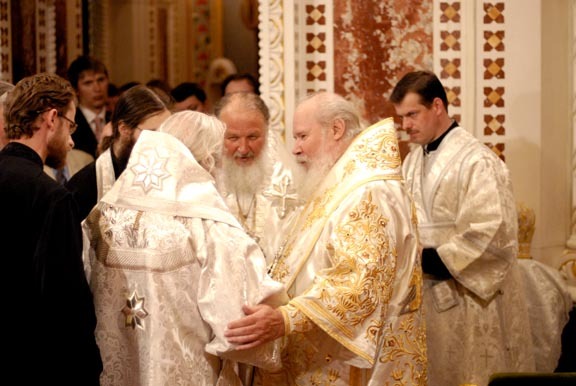 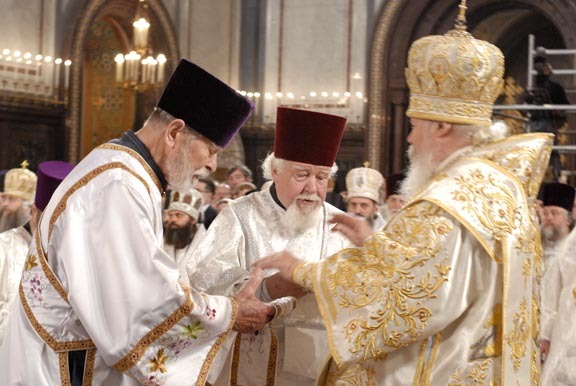 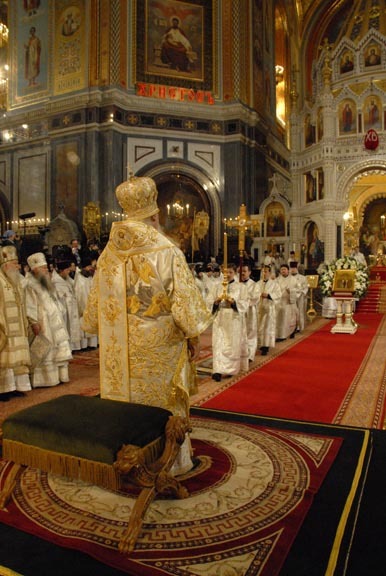 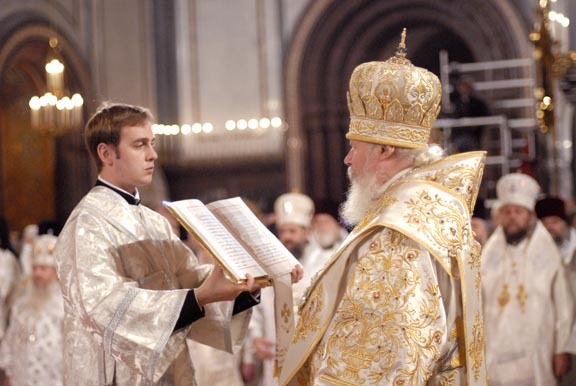 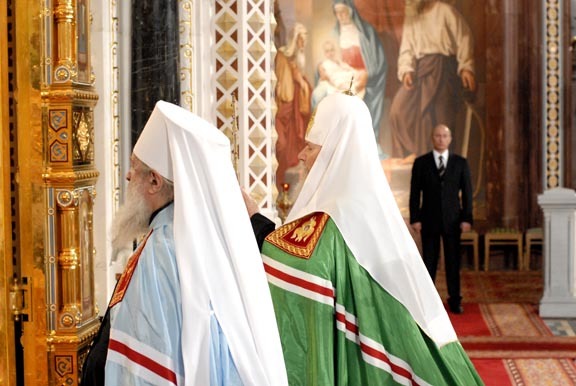 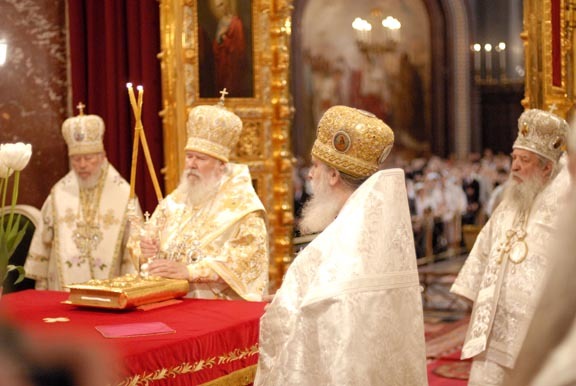 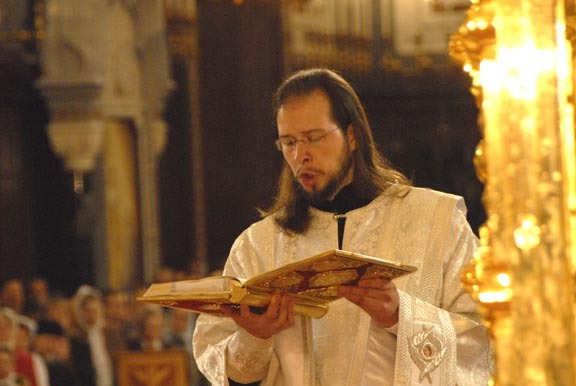 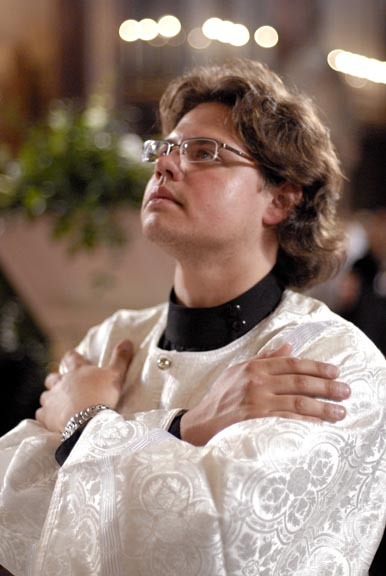 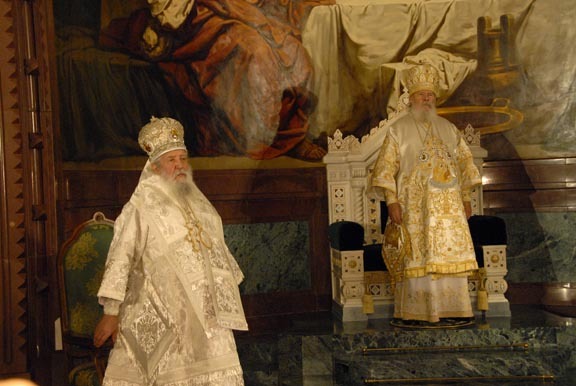 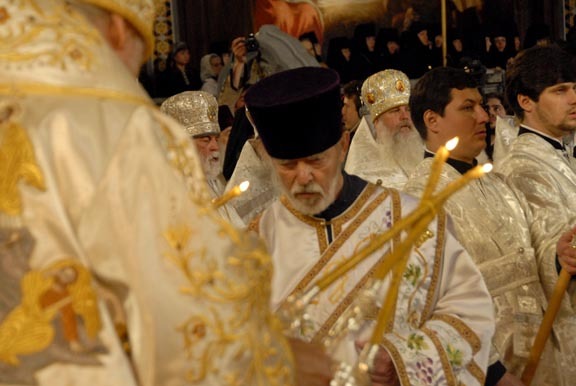 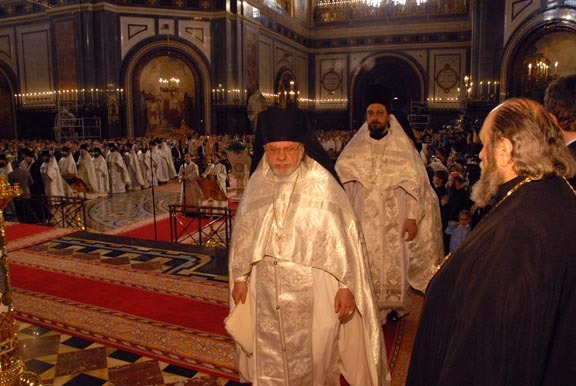 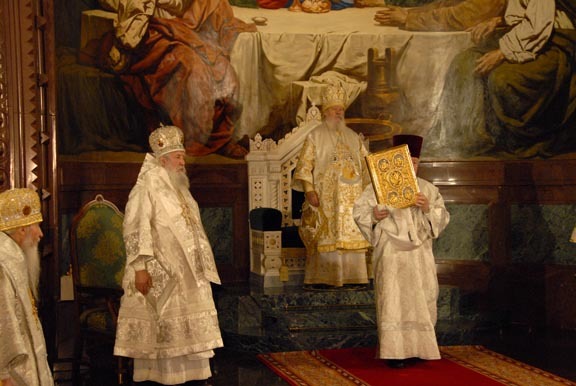 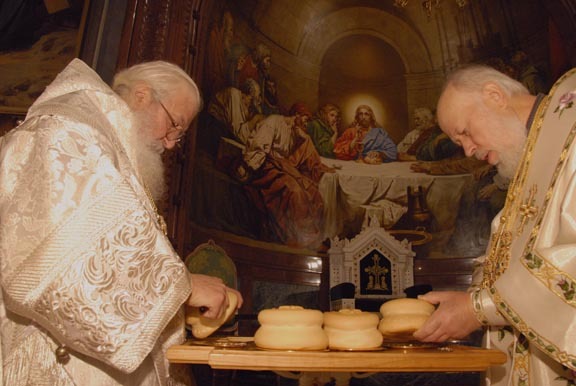 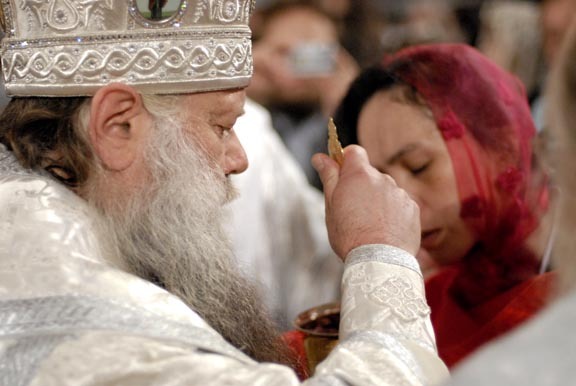 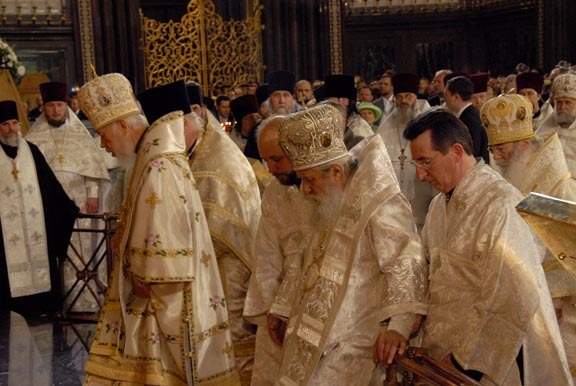 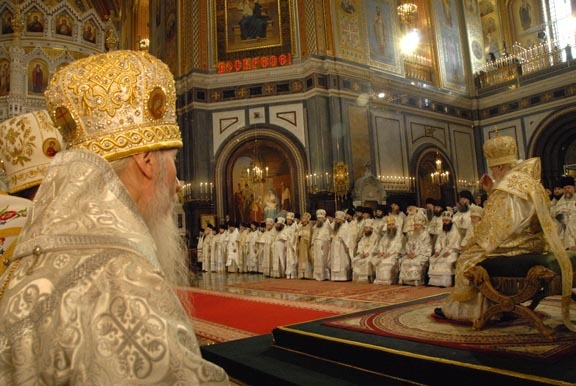 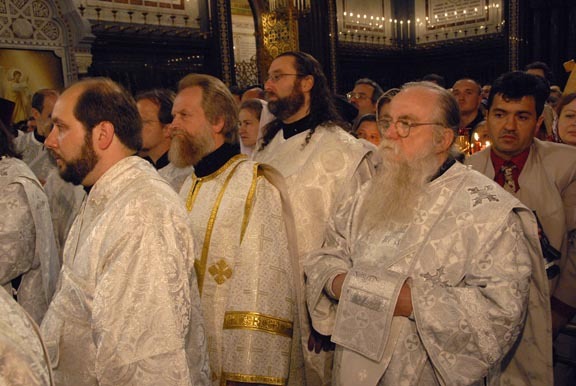 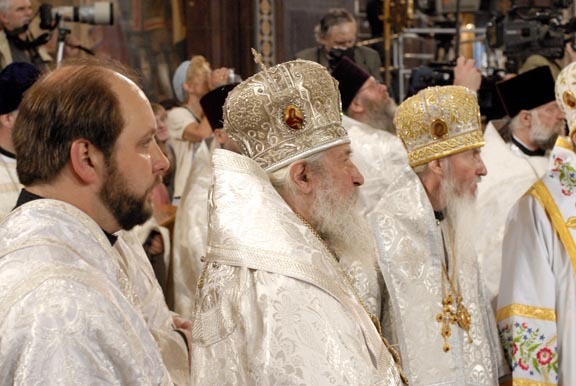 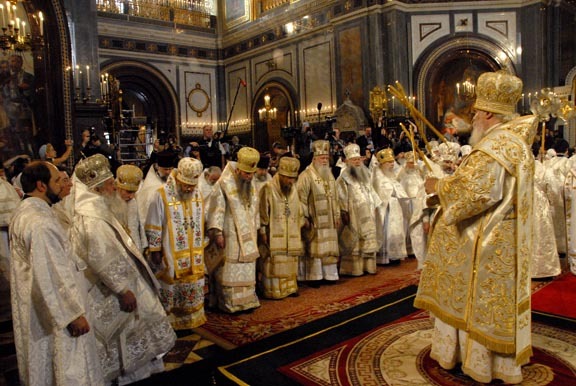 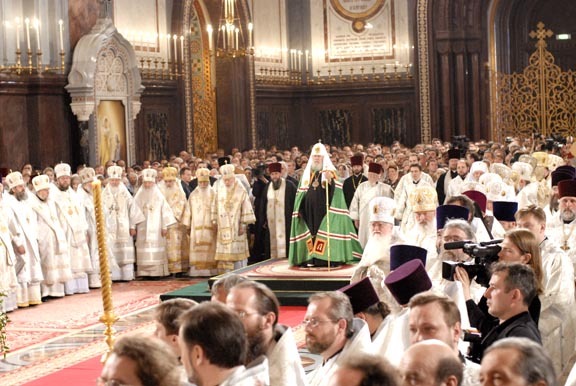 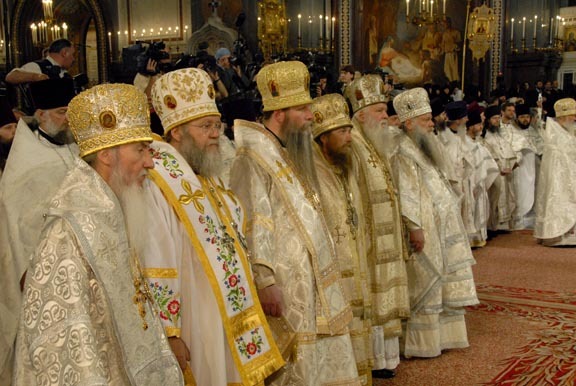 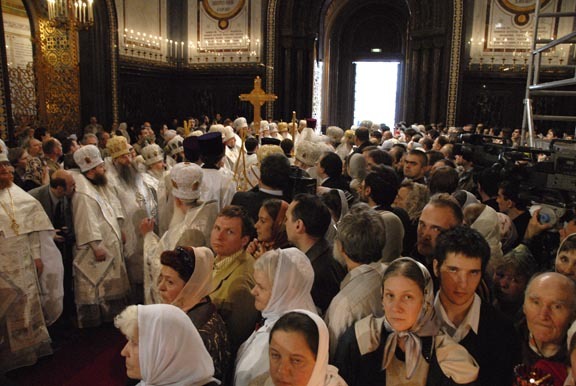 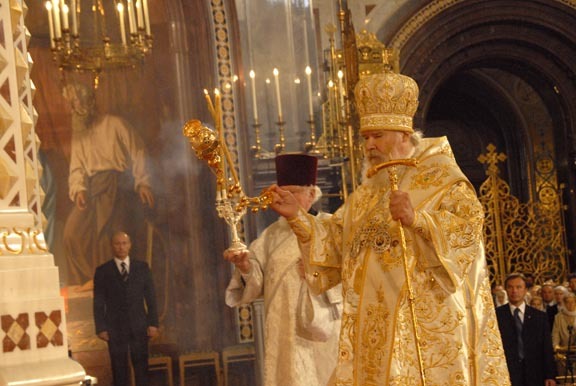 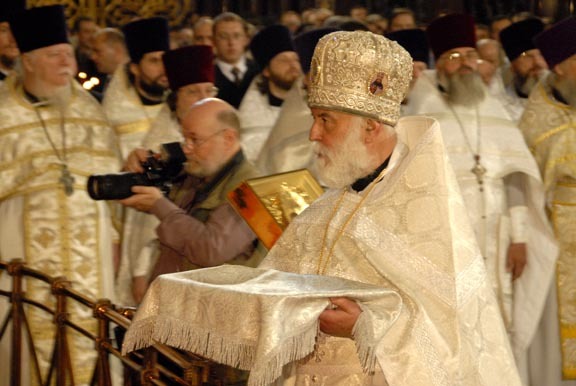 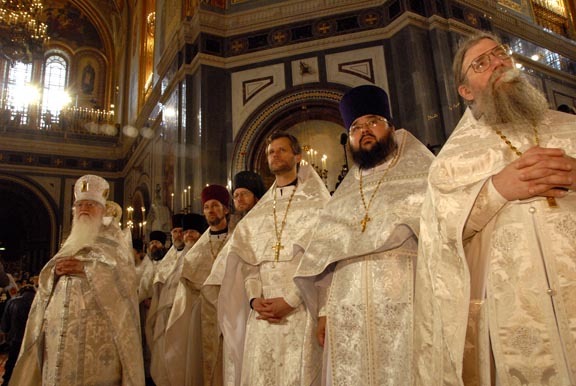 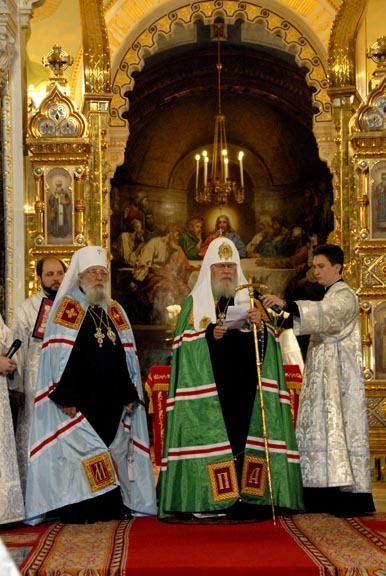 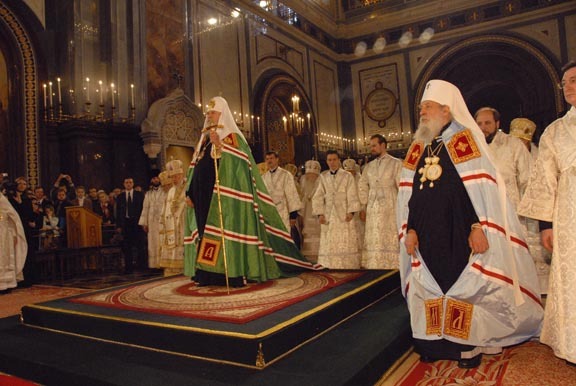 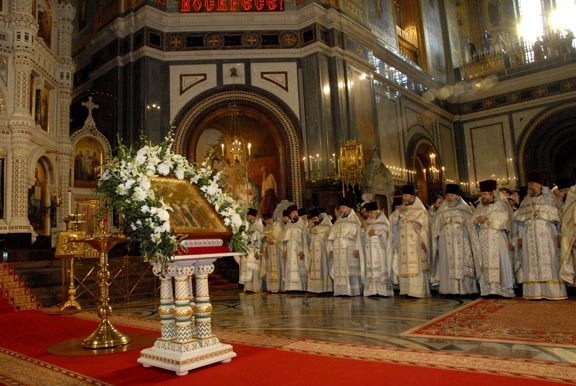 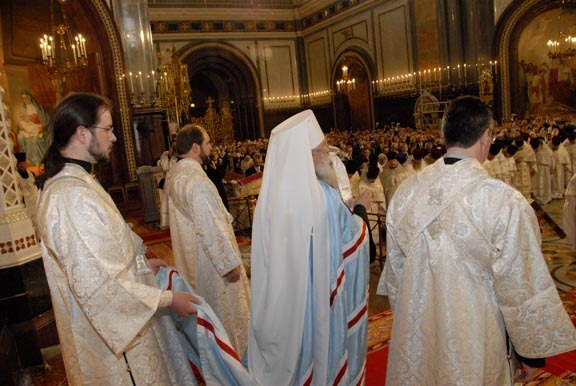 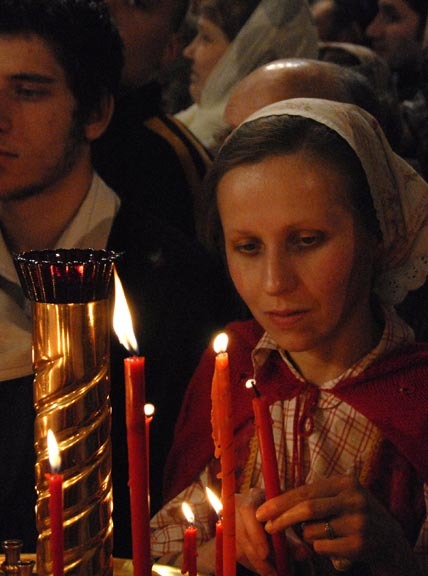 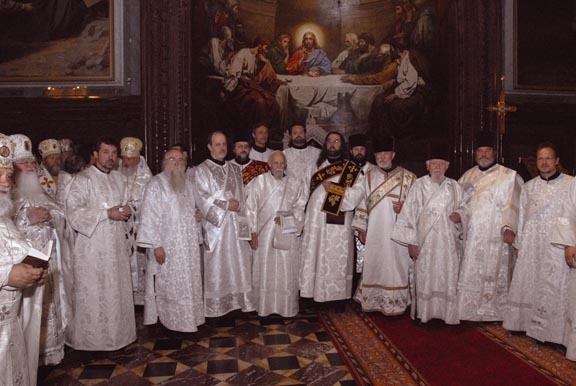 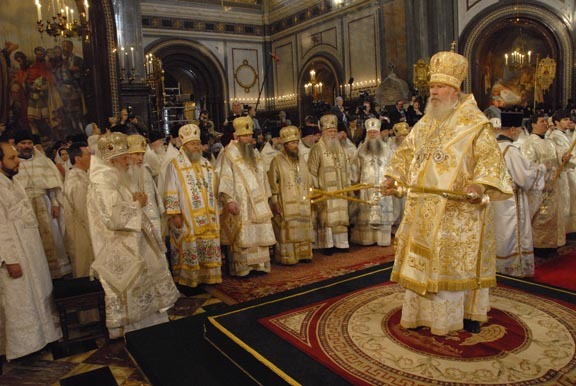 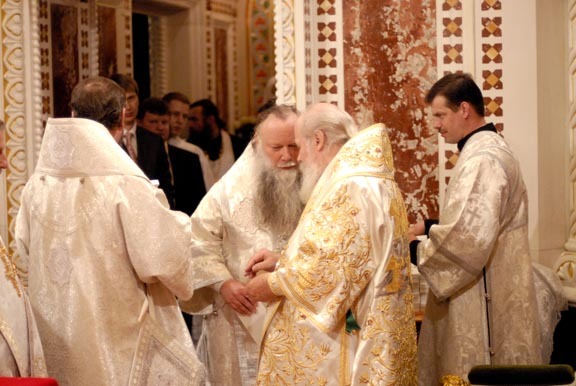 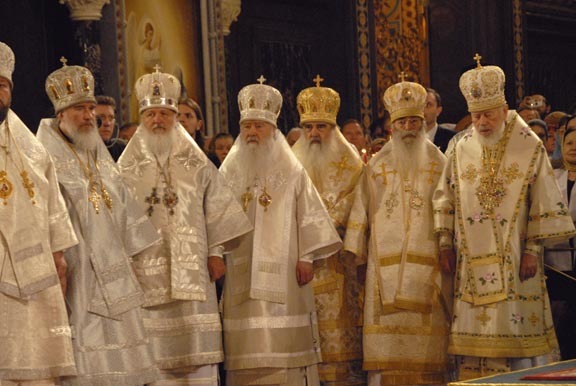 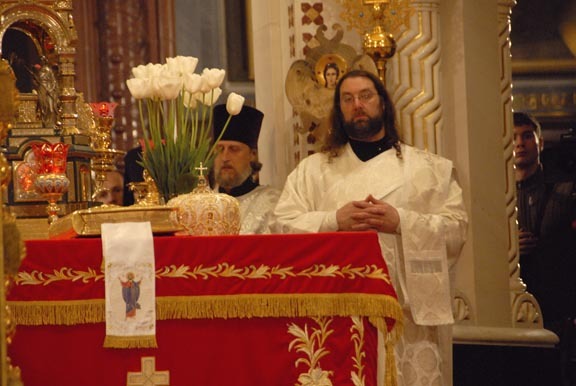 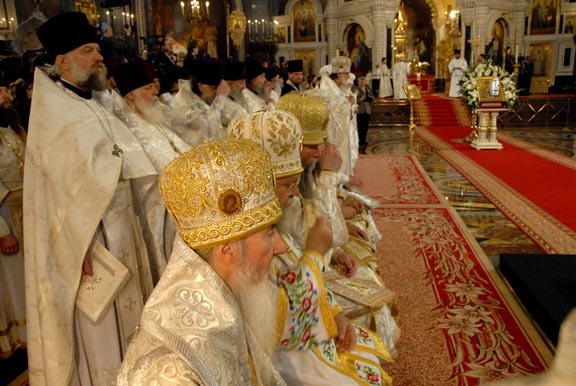 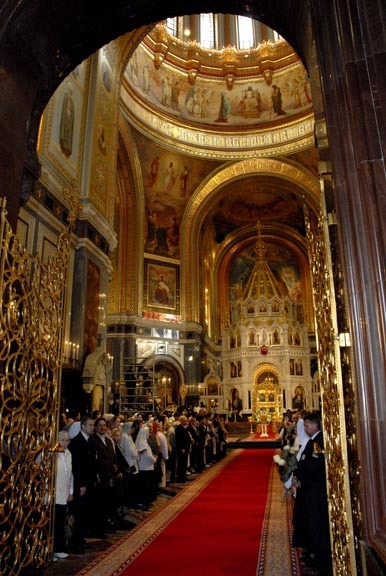 On May 17, 2007, the day of the Ascension of the Lord, the Act of Canonical Communion between the Russian Orthodox Church Outside of Russia and the Moscow Patriarchate was signed. 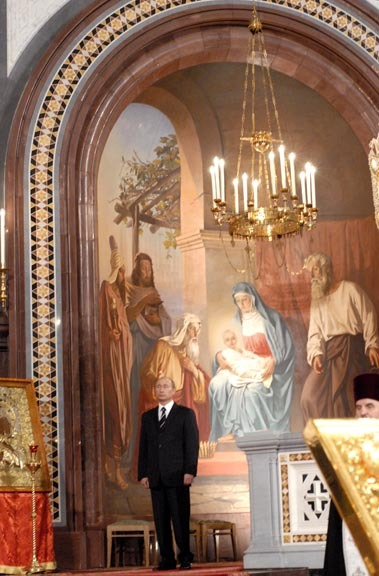 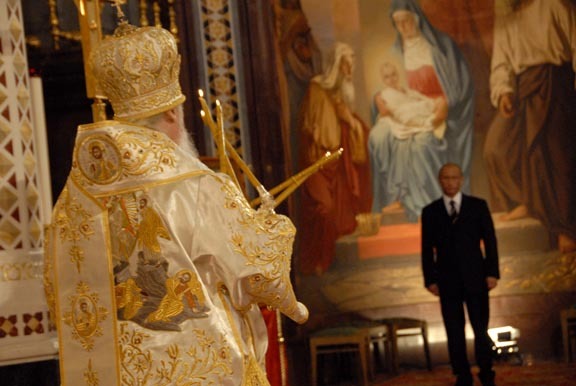 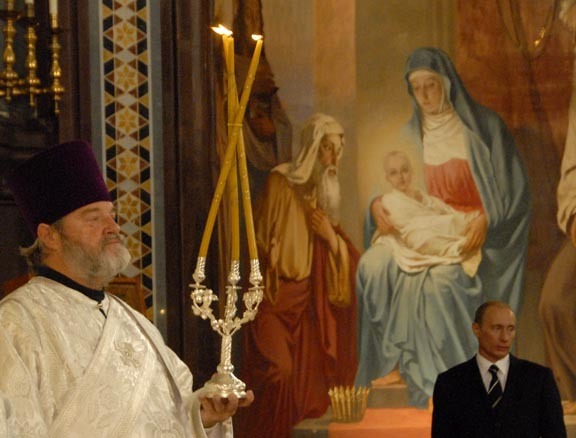 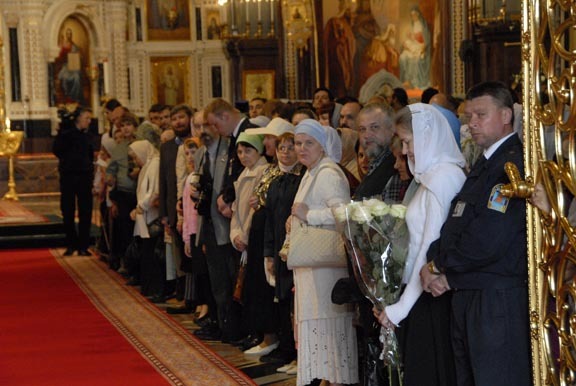 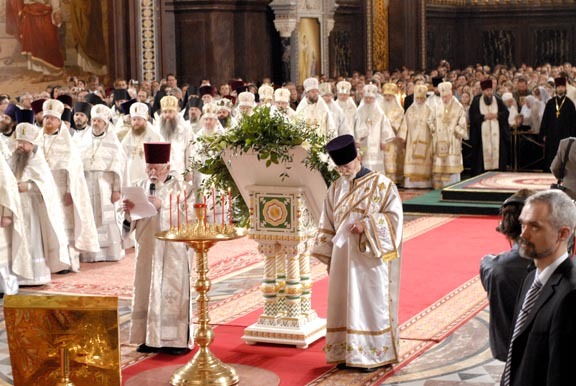 The ceremony of the reestablishment of the fullness of communion within one Local Russian Orthodox Church was attended by President Vladimir Putin of the Russian Federation, along with other government officials. 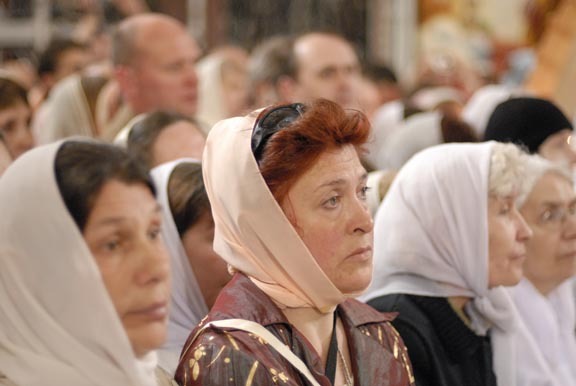 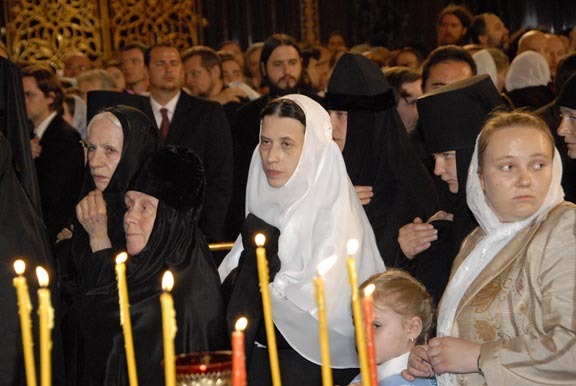 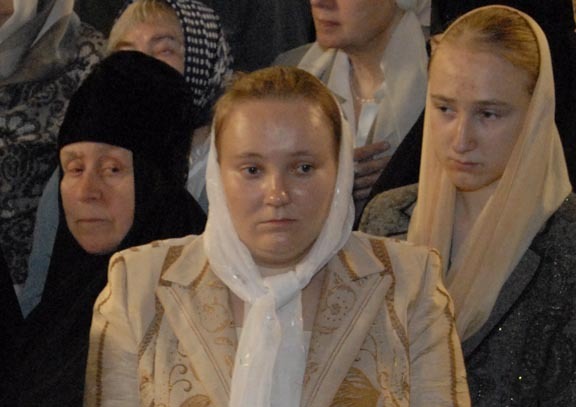 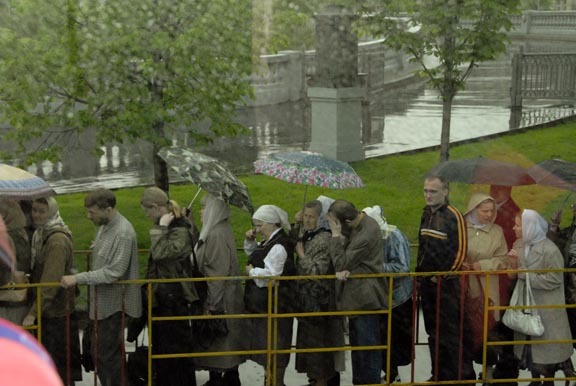 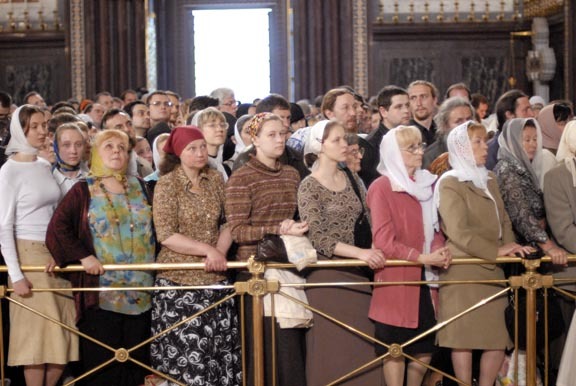 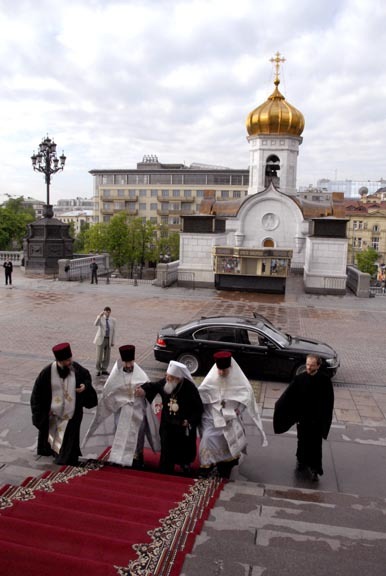 From early morning, a multitude of Orthodox Christians of Moscow and pilgrims of the Russian Orthodox Church Outside of Russia began streaming to the church. 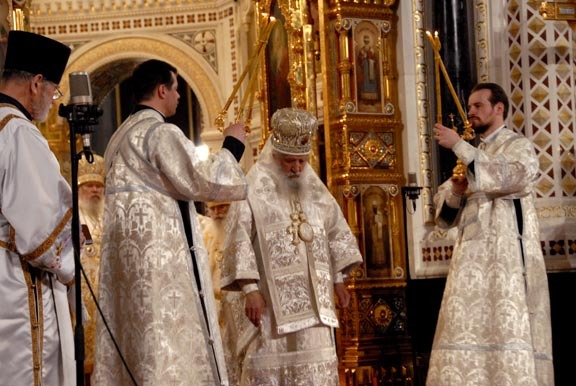 During the proskomedia, the First Hierarch of the Church Abroad arrived. 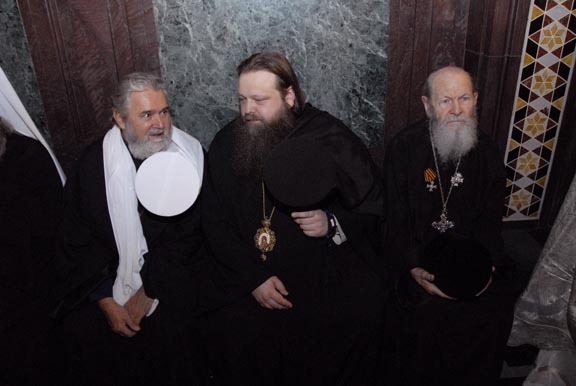 His Eminence was greeted by the Secretary of the Commission of the Russian Orthodox Church Outside of Russia on talks with the Moscow Patriarchate, Protopriest Alexander Lebedeff, and the Secretary of the Commission of the Moscow Patriarchate on talks with the Church Abroad, Protopriest Nikolai Balashov. 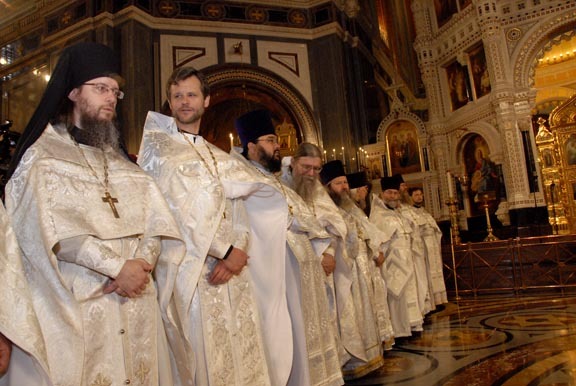 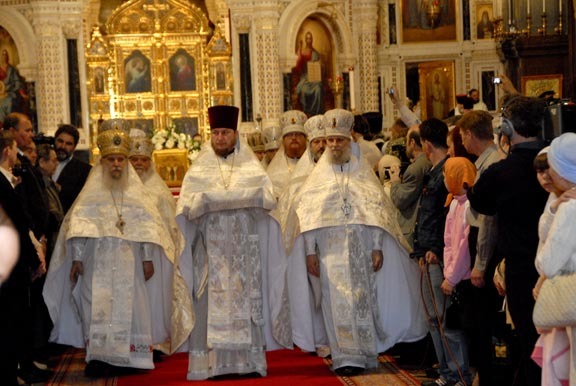 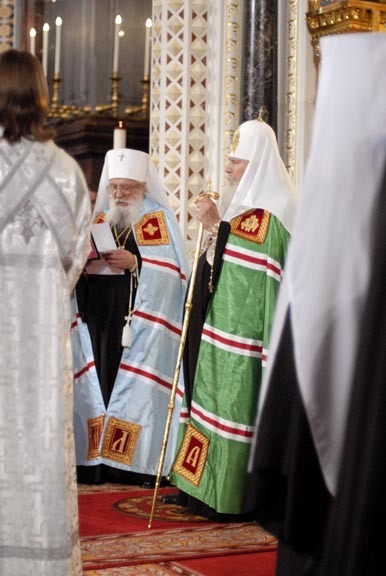 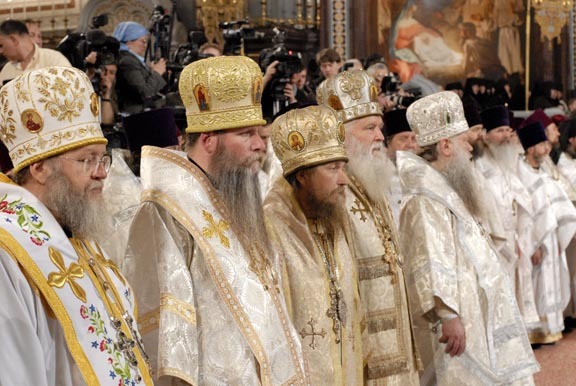 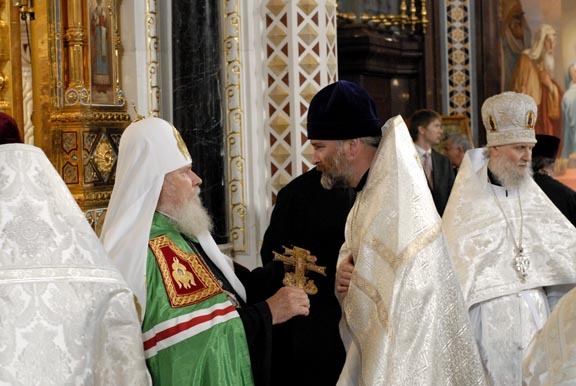 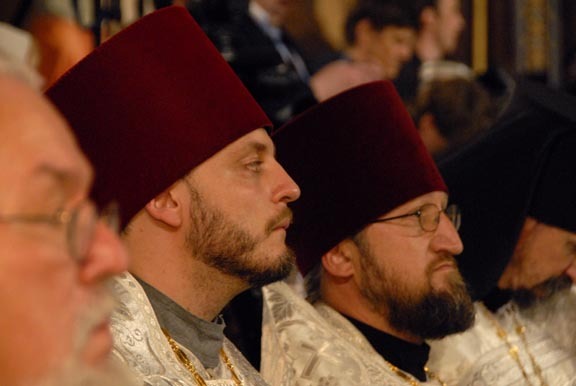 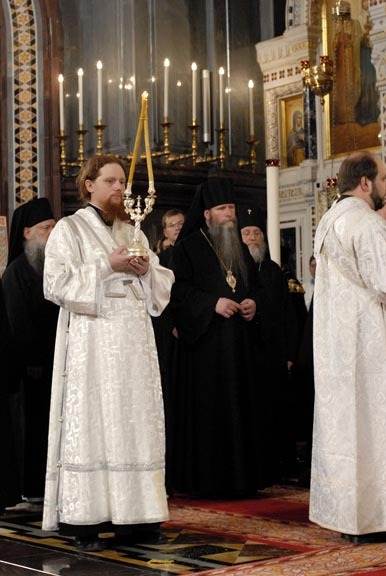 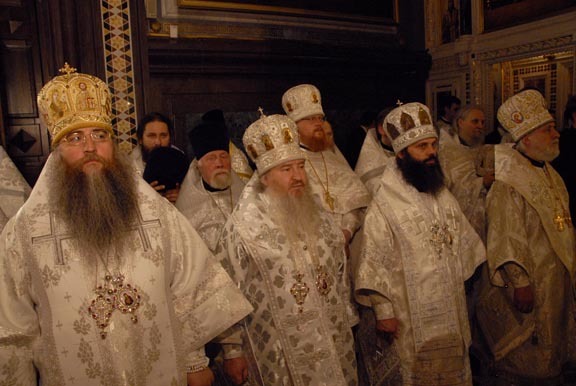 Clergymen of the Moscow Patriarchate emerged from one of the side altar doors to greet His Eminence, and an equal number of clergymen of the Russian Orthodox Church Outside of Russia from the other side. 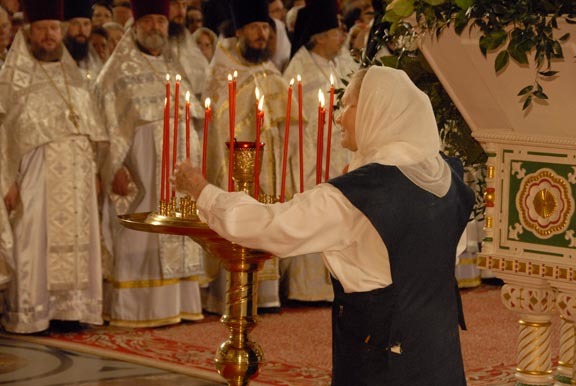 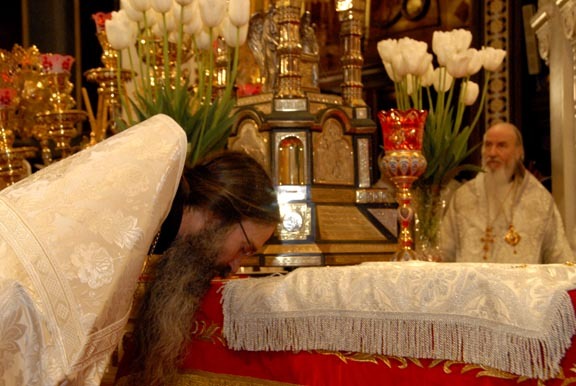 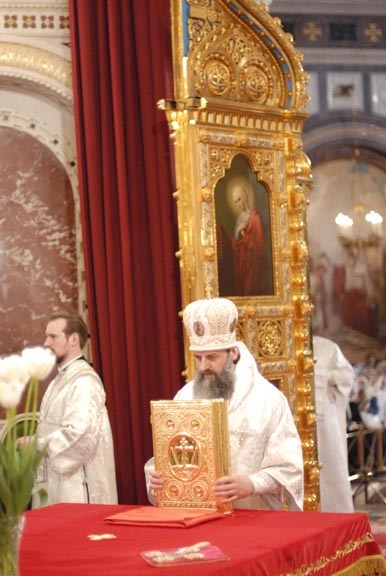 Venerating the altar-table cross, His Eminence Metropolitan Laurus blessed the clerics and worshipers with it, and then entered the altar. 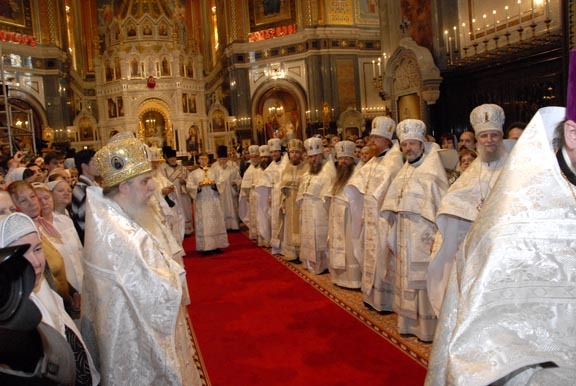 Greeting His Holiness Patriarch Alexy II of Moscow and All Russia were the archpastors of the Russian Orthodox Church Outside of Russia and members of the Holy Synod of the Moscow Patriarchate, plus Archbishop Innokenty of Korsun and Archbishop Evgeny of Verey, members of the Moscow Patriarchate's Commission, who all emerged together through the Royal Doors wearing white vestments. 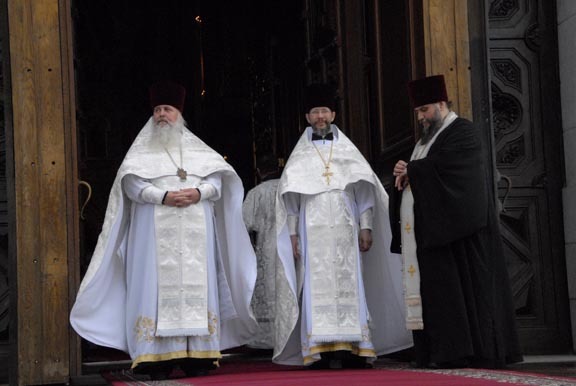 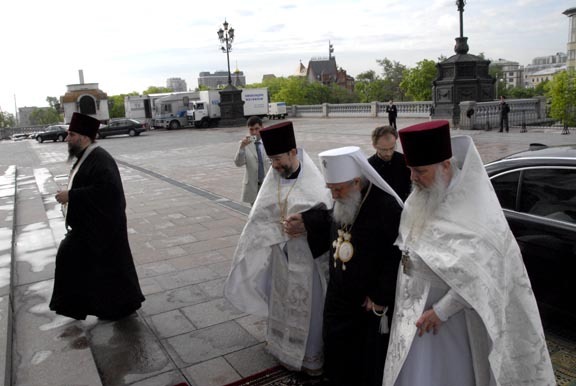 As the bells of Christ the Savior Cathedral pealed overhead, His Holiness was greeted by the Dean of the Central Deanery of Moscow, Protopriest Vladimir Divakov, and Senior Priest of Christ the Savior Cathedral, Protopriest Mikhail Ryazantsev. 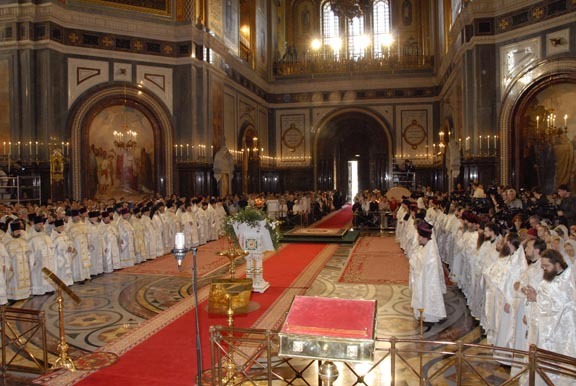 Donning the mantle, His Holiness blessed the bishops and clergymen with the cross, after which he ascended the cathedra in the middle of the church. 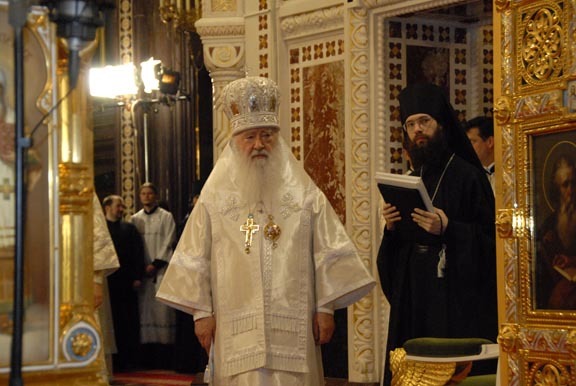 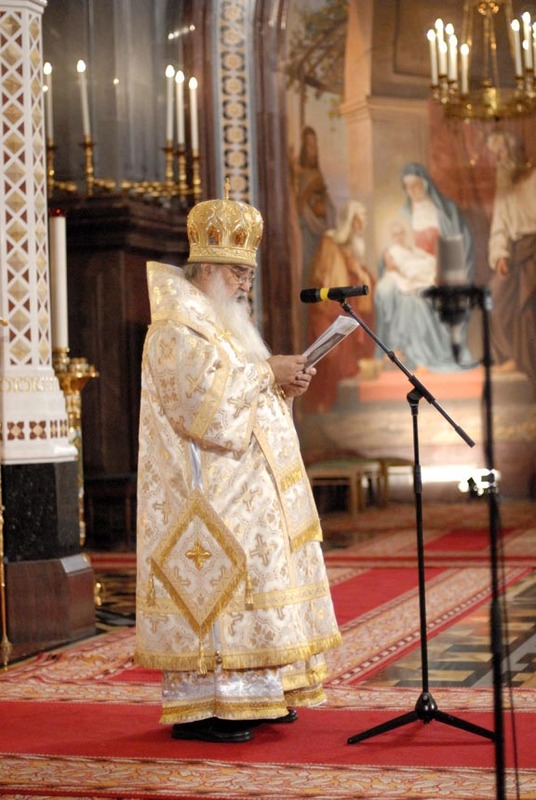 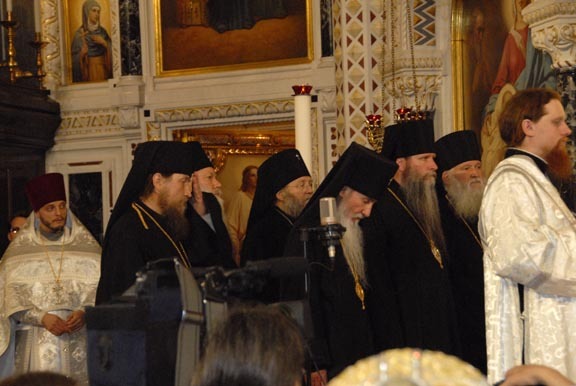 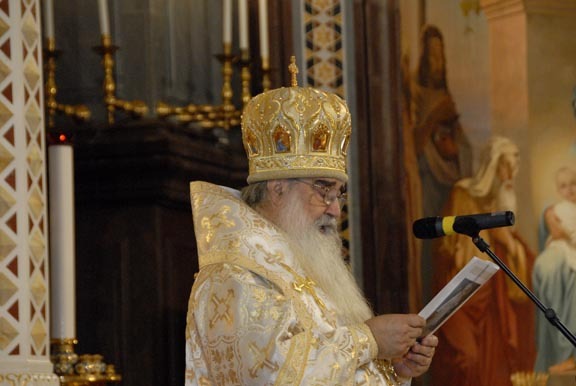 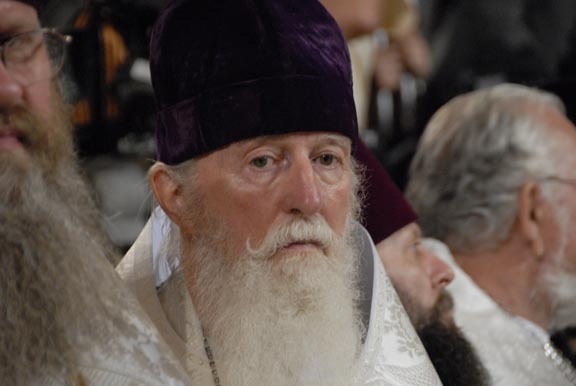 As His Holiness Patriarch Alexy II entered the church, His Eminence Metropolitan Laurus of Eastern America and New York proceeded to the cathedra. 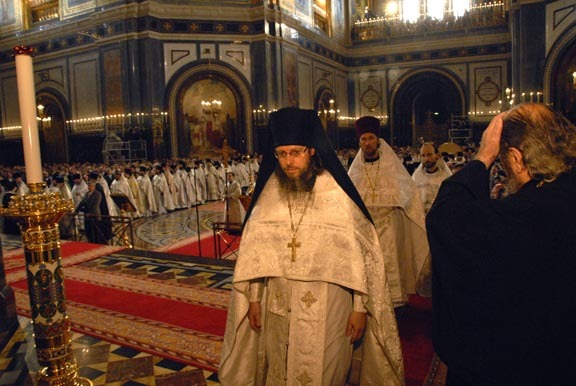 Standing on the north and south sides were the bishops and clergymen of the Russian Orthodox Church Outside of Russia and the Moscow Patriarchate. 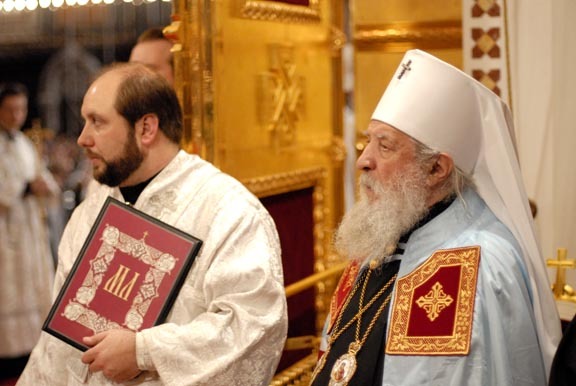 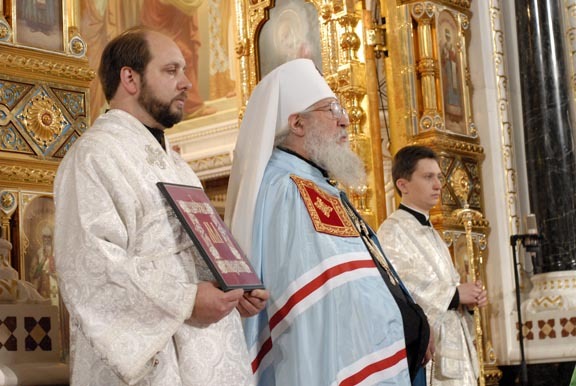 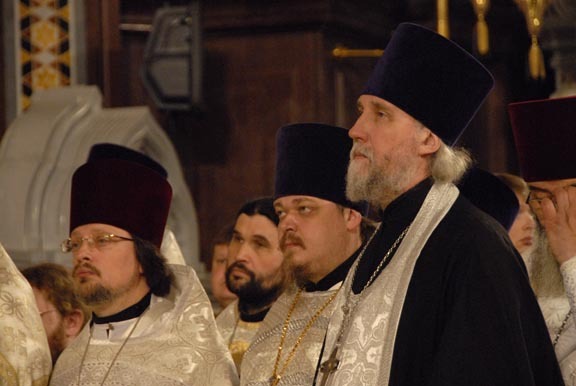 Then, the Secretaries of both Church Commissions, Mitred Protopriest Alexander Lebedeff and Protopriest Nikolai Balashov read the texts of the decrees of the Holy Synod of the Moscow Patriarchate and of the Synod of Bishops of the Russian Orthodox Church Outside of Russia on the confirmation of the Act of Canonical Communion. 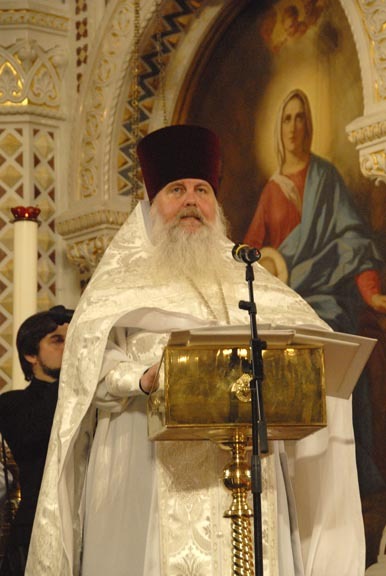 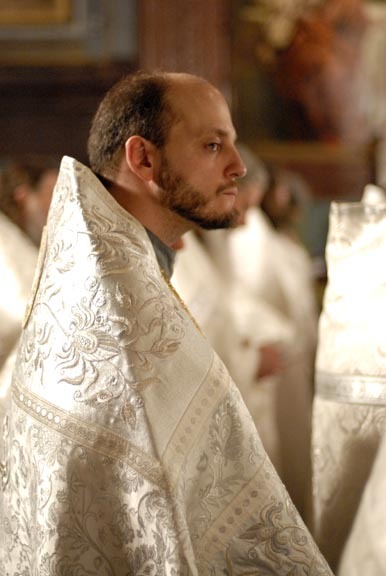 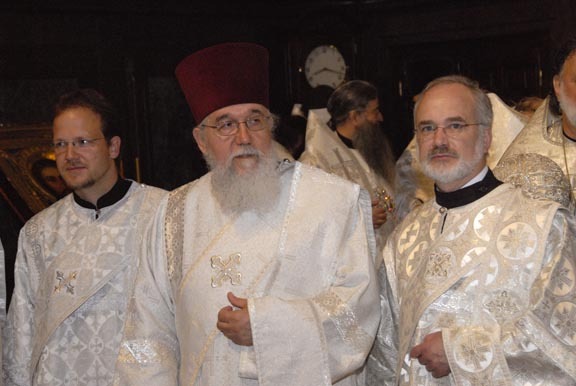 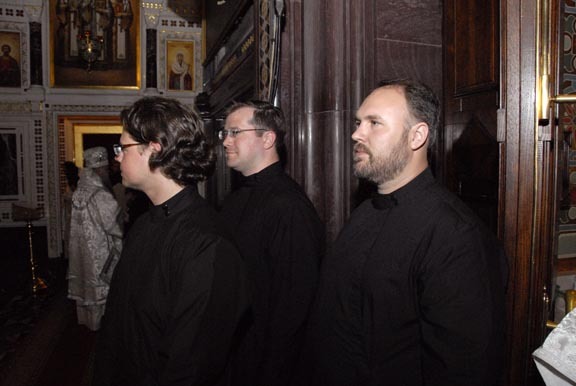 The text of the Act itself was read from the ambo by Protodeacon Vladimir Nazarkin. 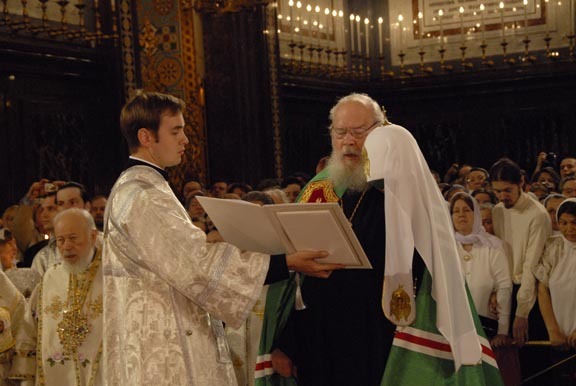 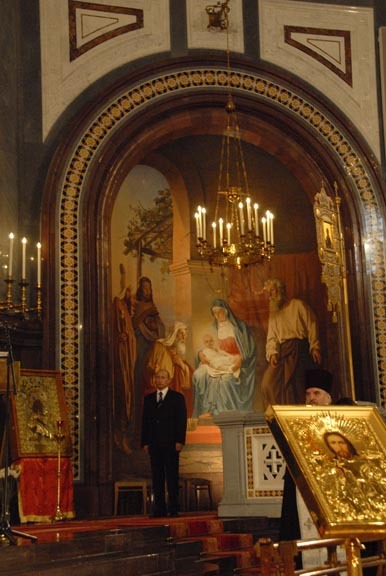 The Act was then signed on the ambo of Christ the Savior Cathedral. 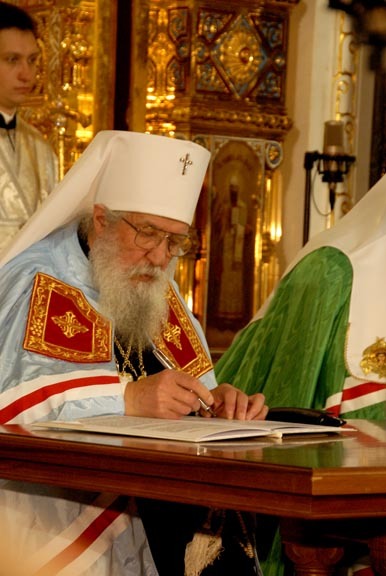 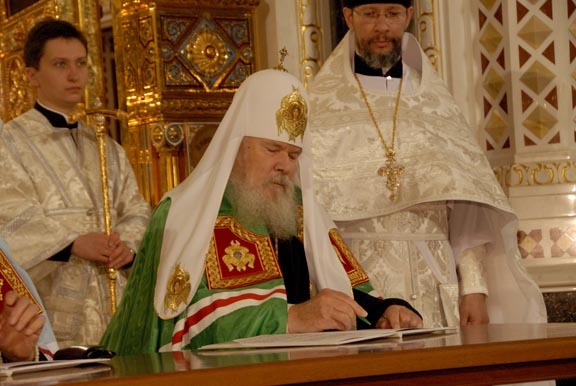 His Holiness Patriarch Alexy II of Moscow and All Russia and His Eminence Metropolitan Laurus of Eastern America and New York put their signatures under this historic document. 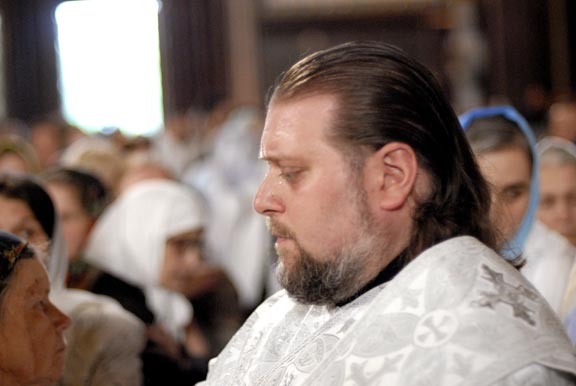 Then, with the words “Christ is among us! 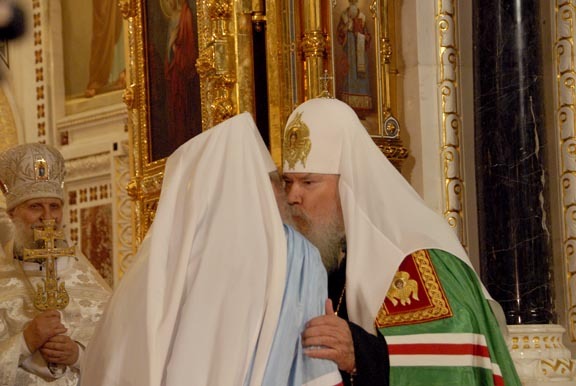 Now and forever,” they kissed each other three times. 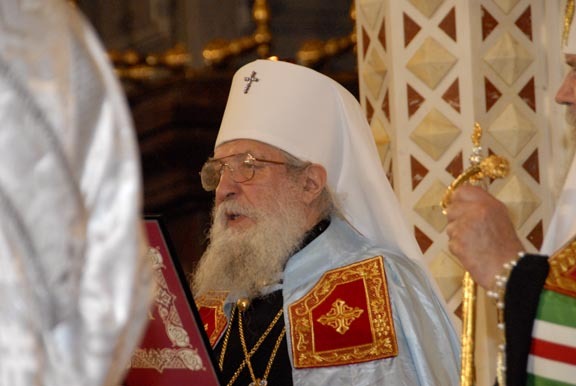 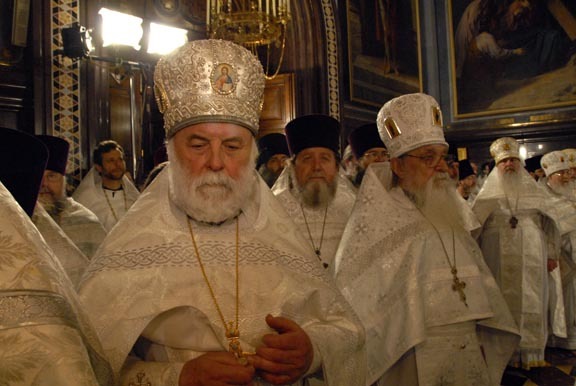 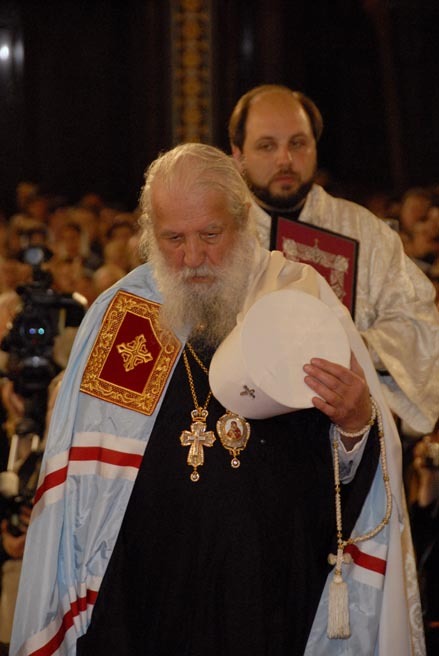 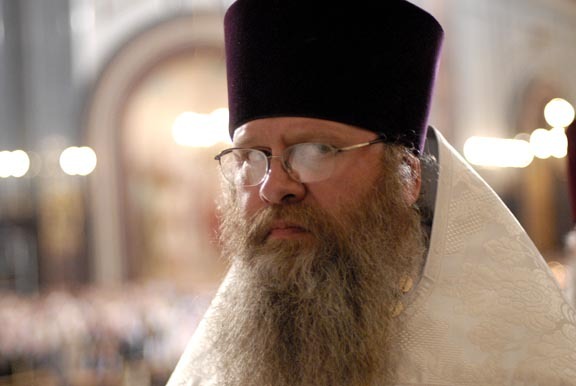 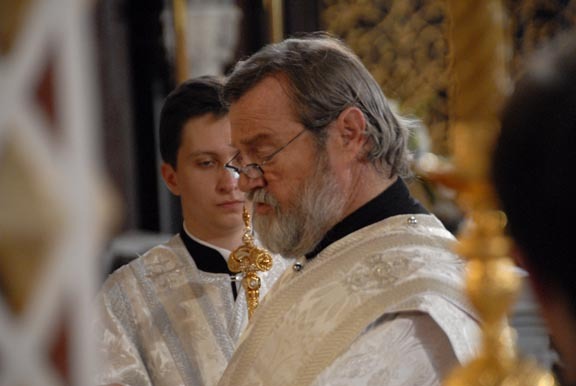 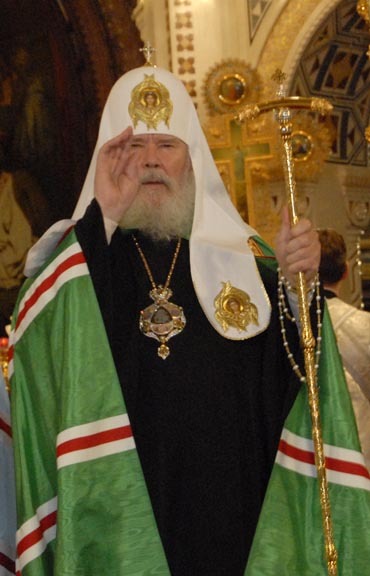 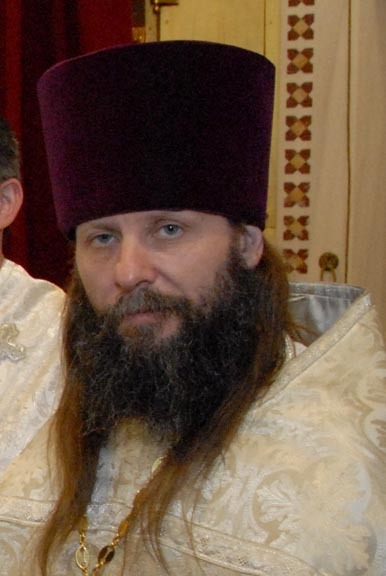 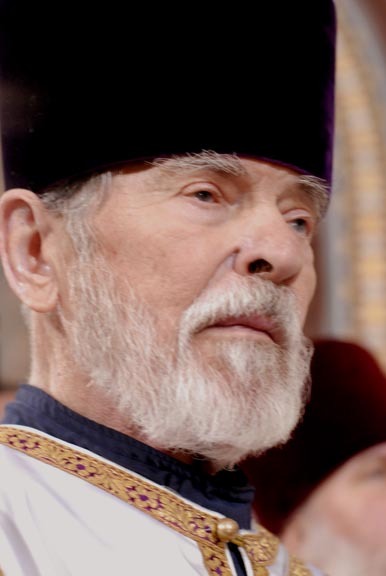 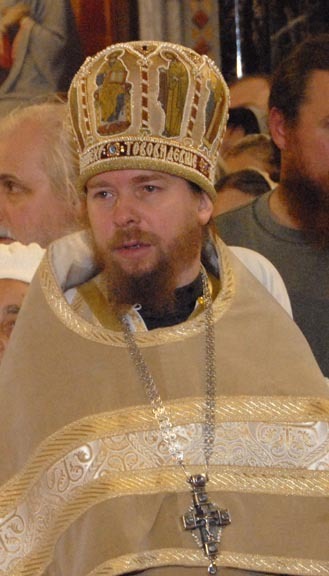 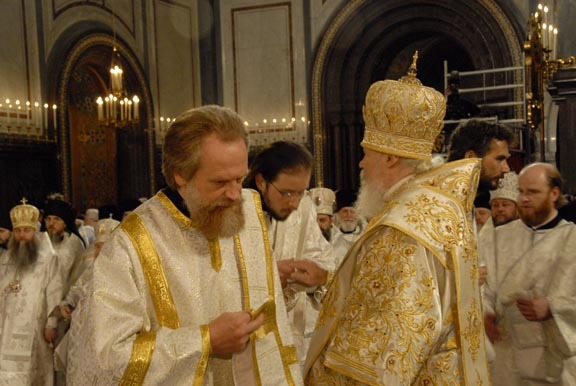 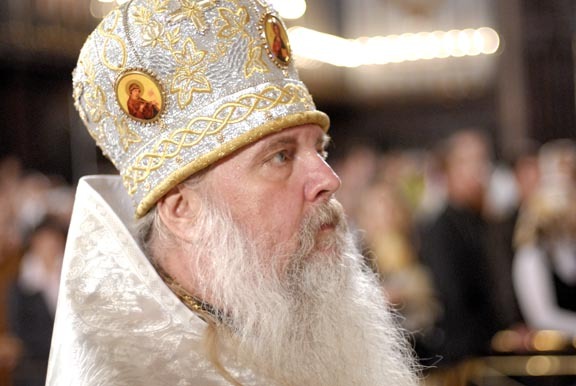 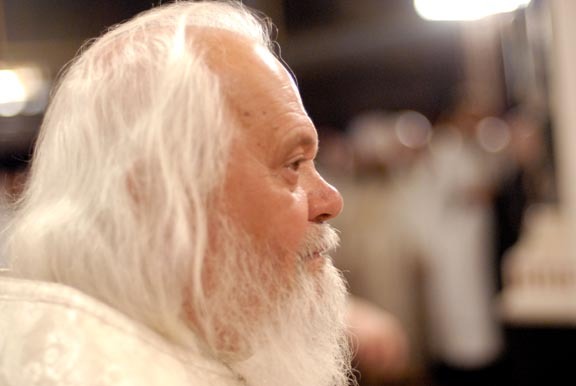 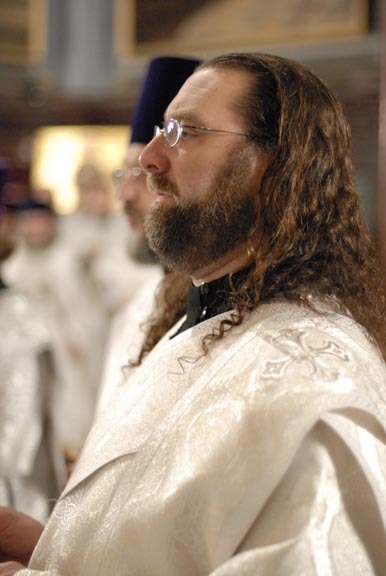 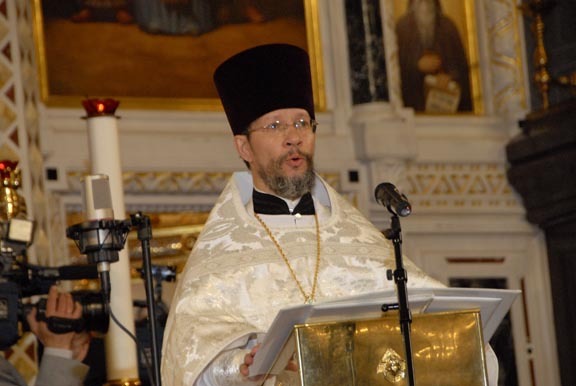 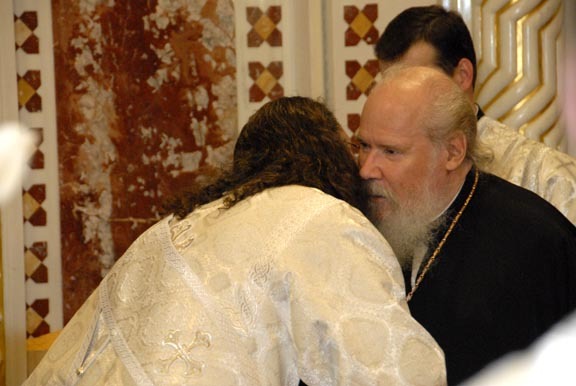 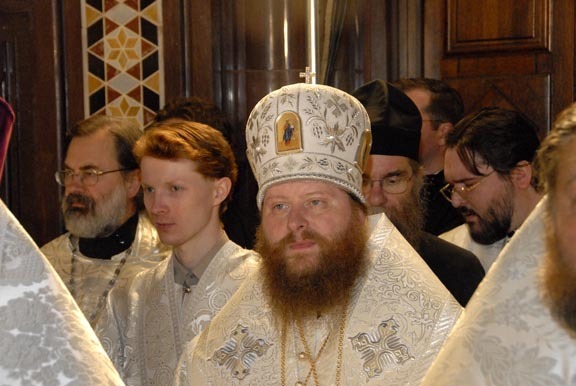 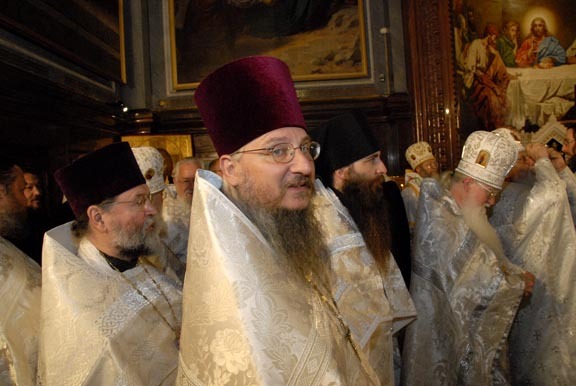 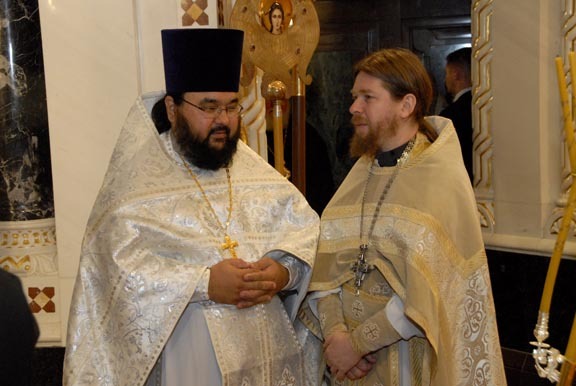 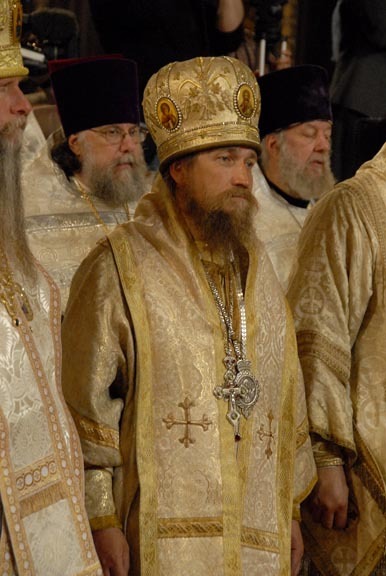 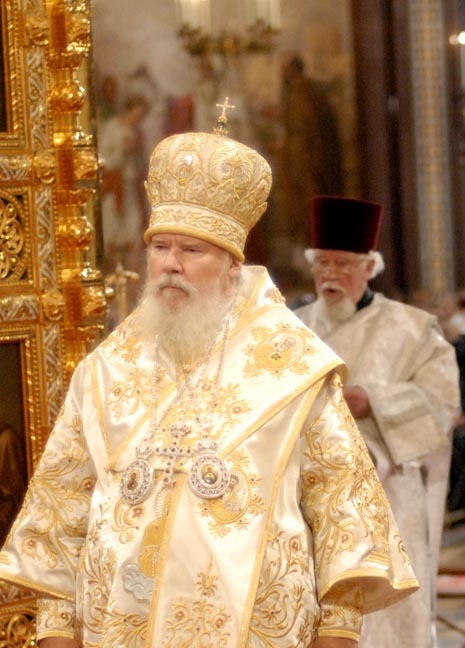 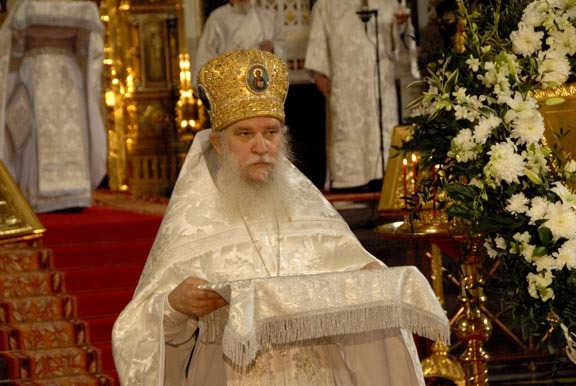 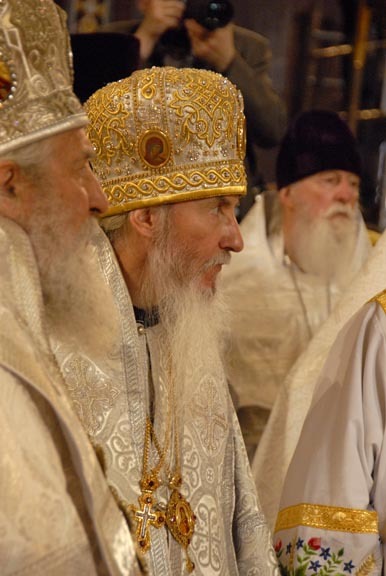 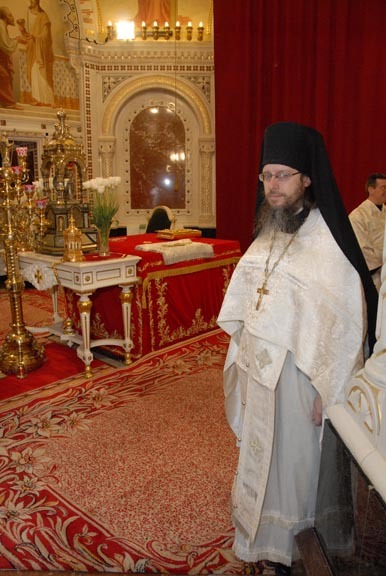 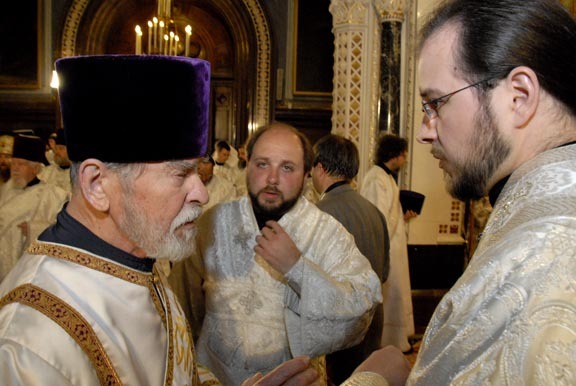 Archdeacon Andrei Mazur intoned Many Years to Patriarch Alexy and the Holy Synod of the Moscow Patriarchate, to His Eminence Metropolitan Laurus, First Hierarch of the Russian Orthodox Church Outside of Russia and its Synod of Bishops. 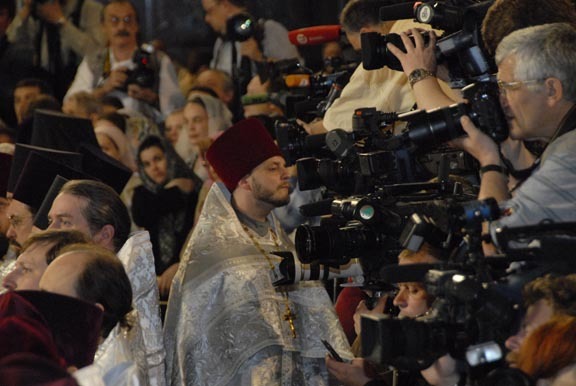 “Your Holiness! 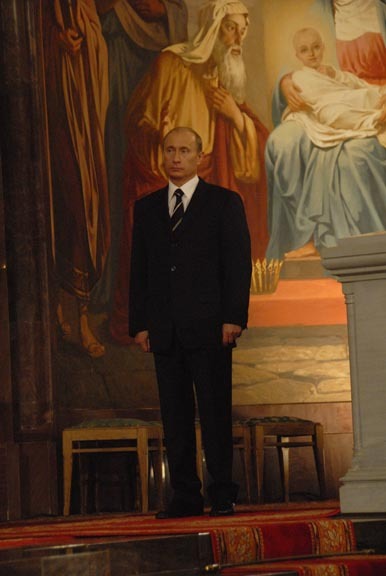 Your Excellency! 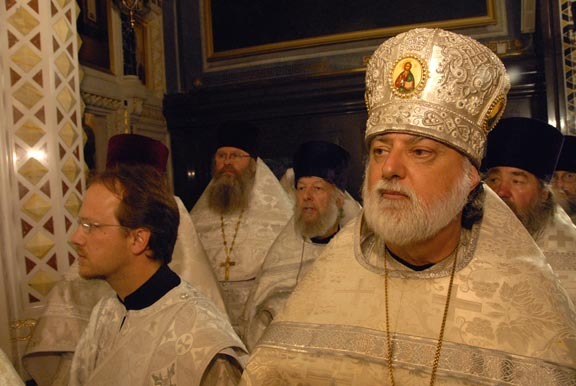 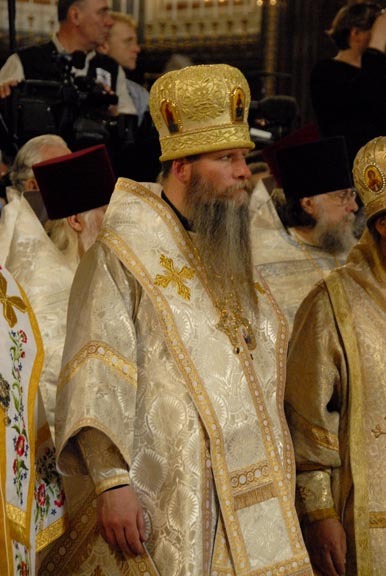 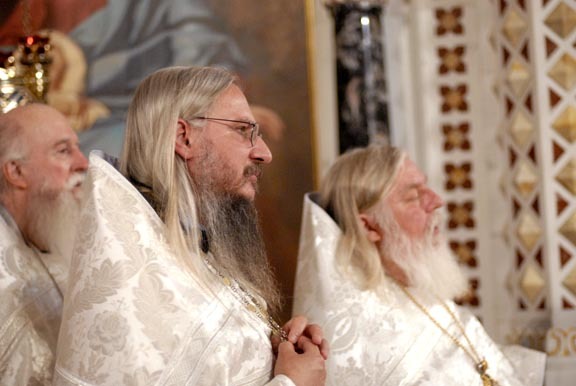 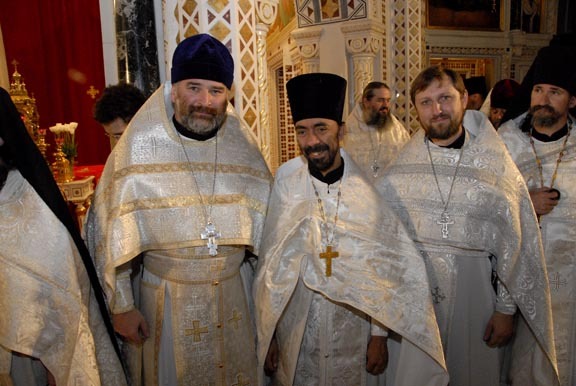 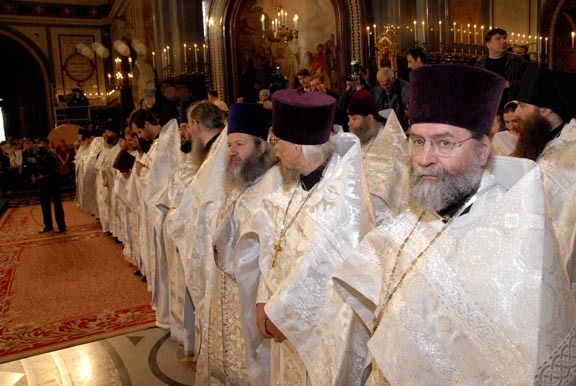 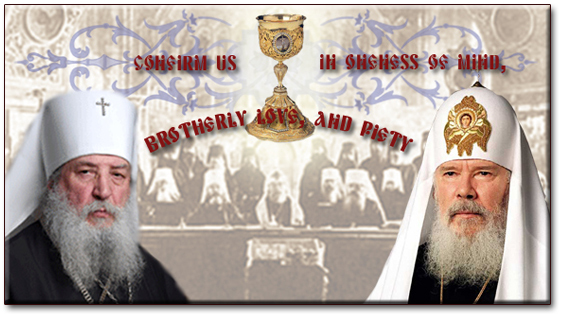 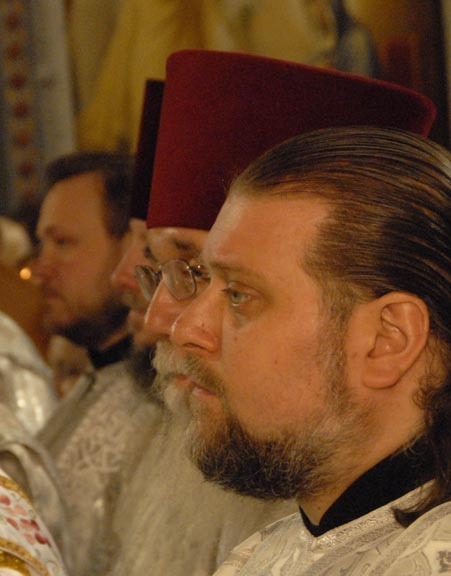 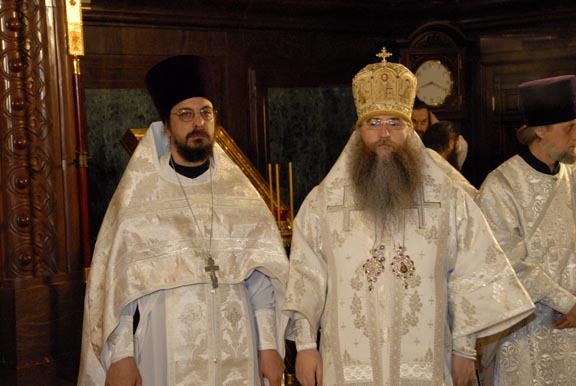 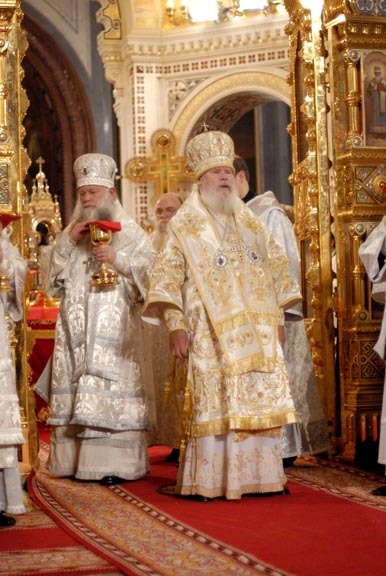 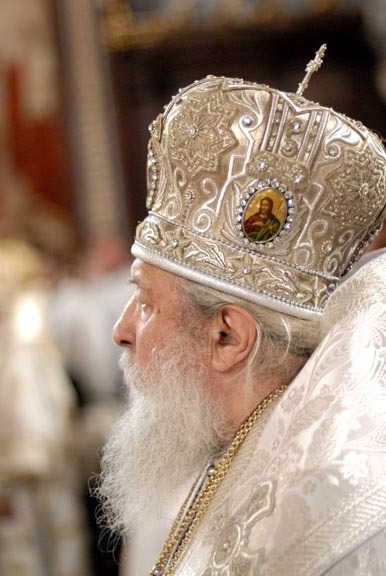 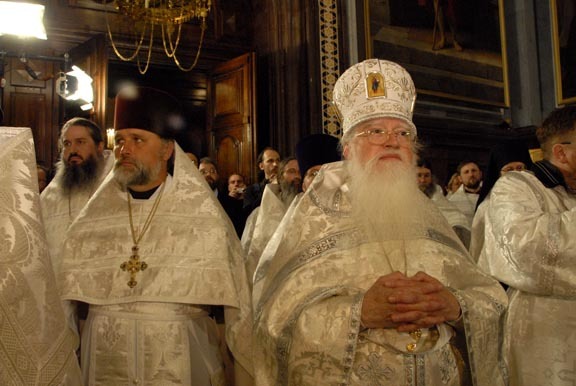 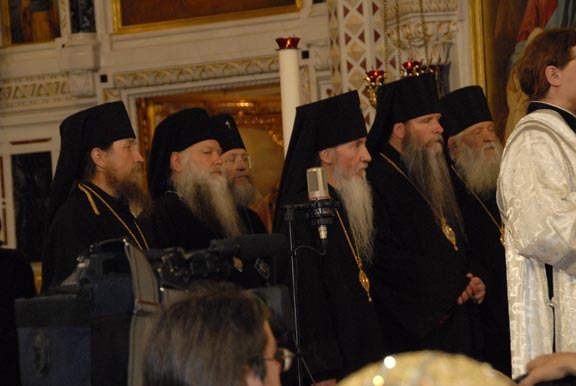 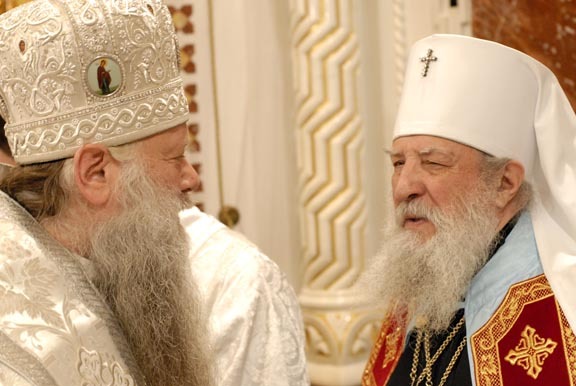 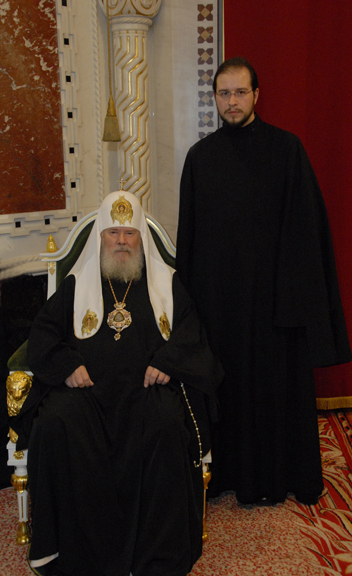 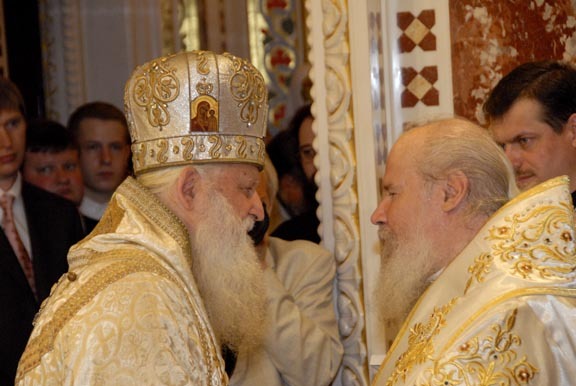 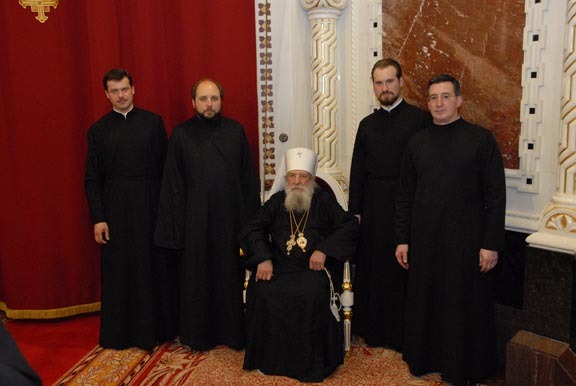 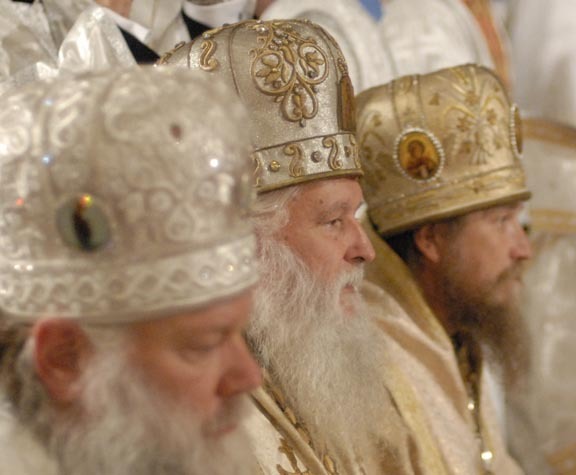 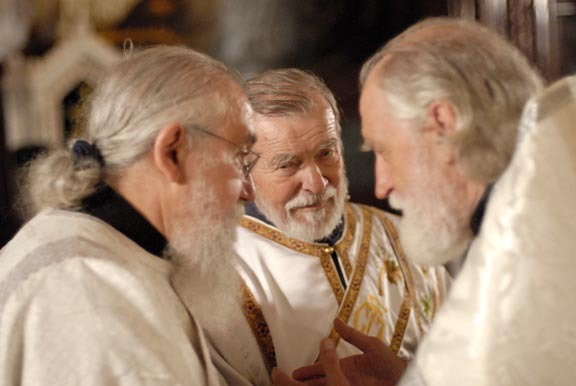 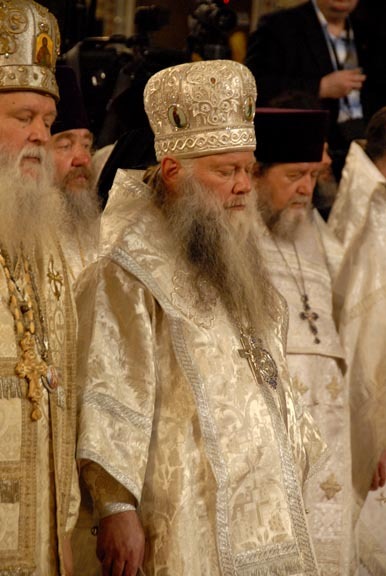 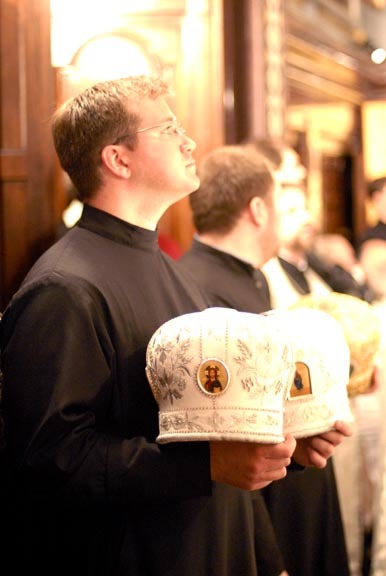 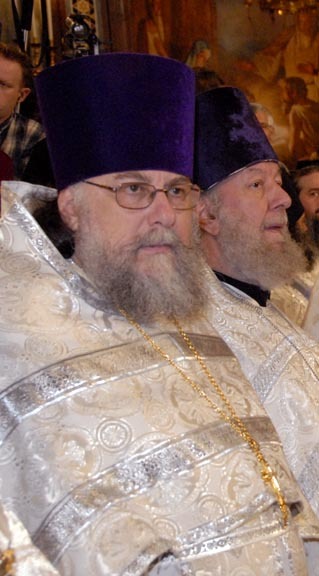 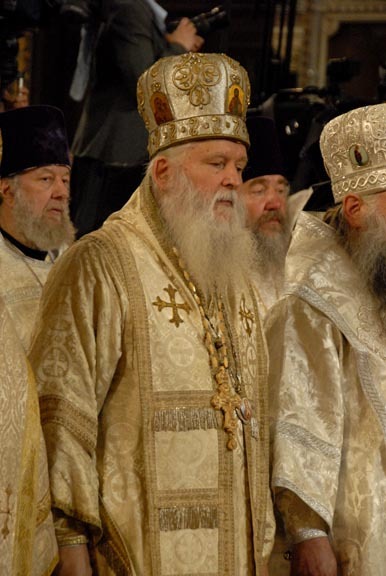 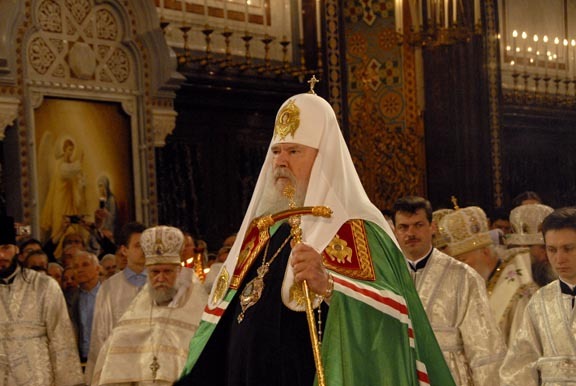 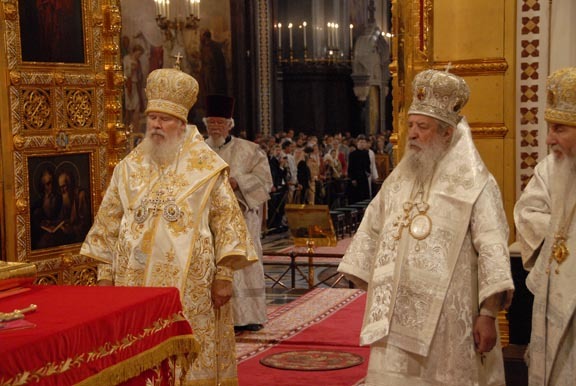 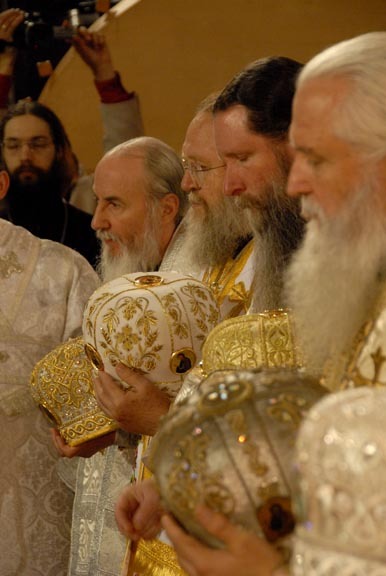 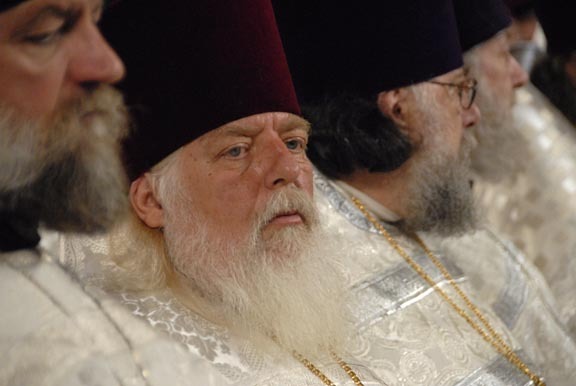 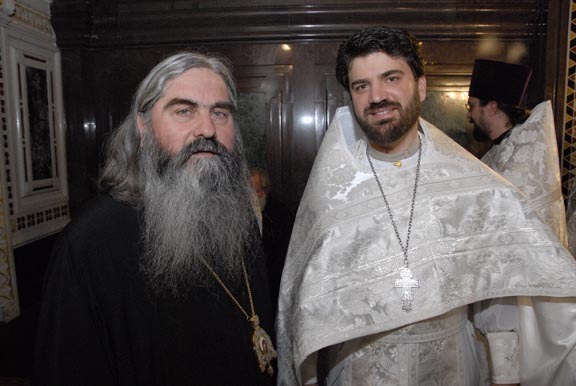 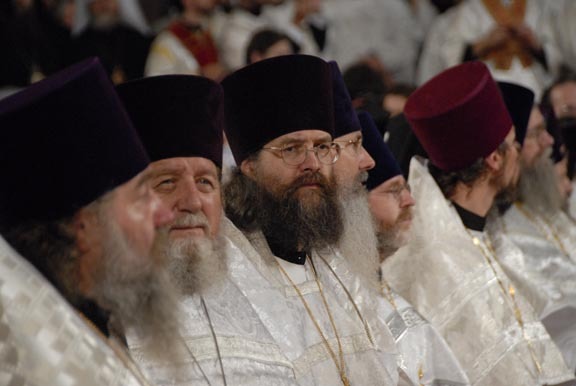 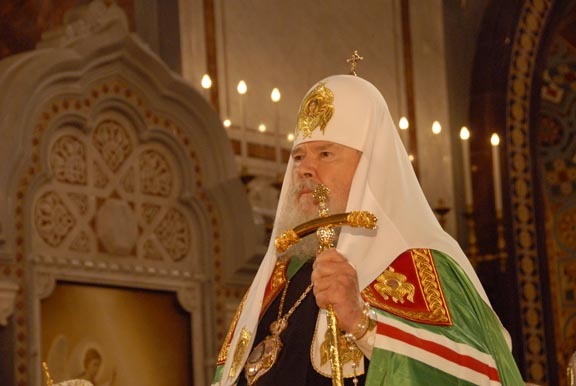 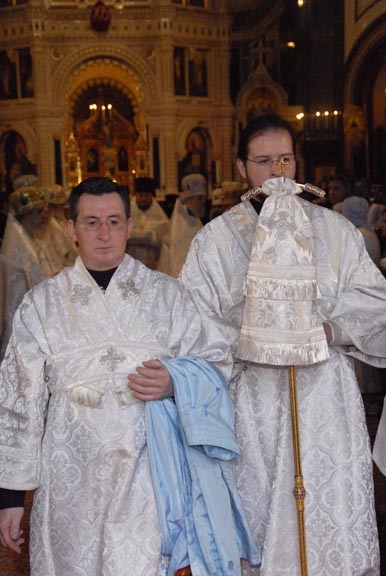 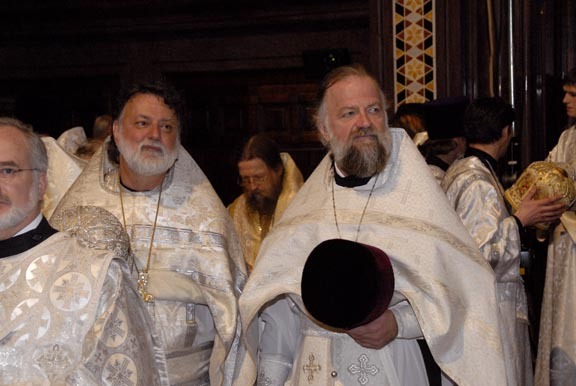 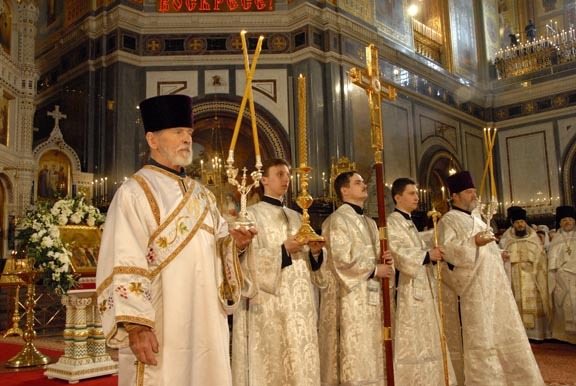 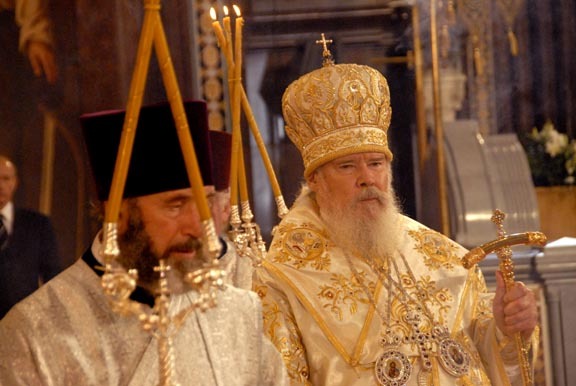 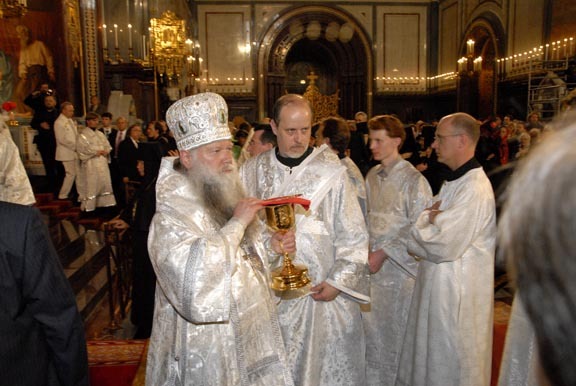 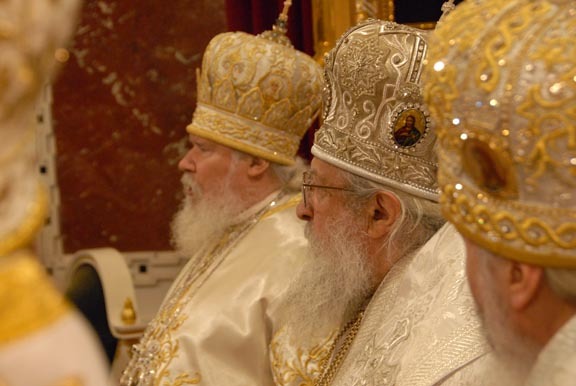 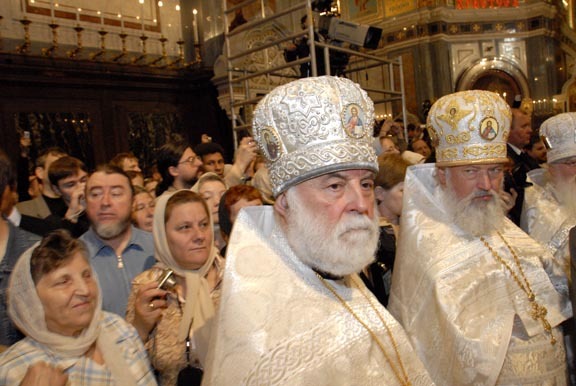 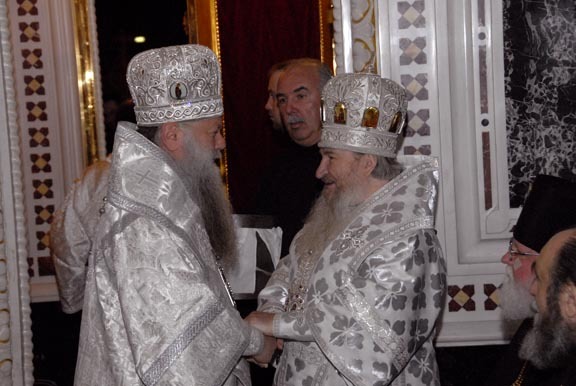 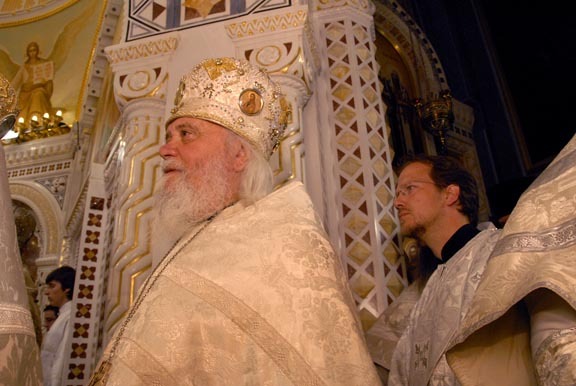 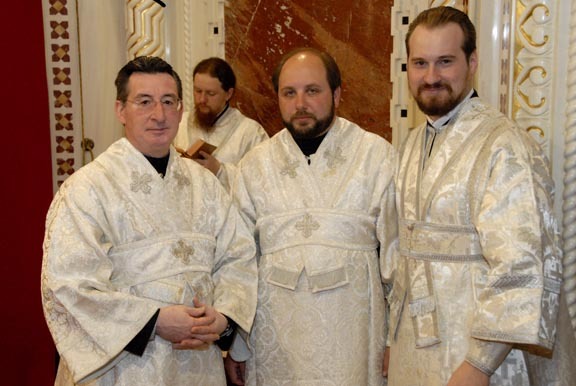 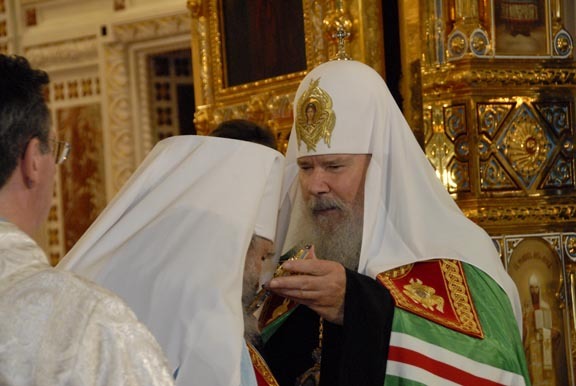 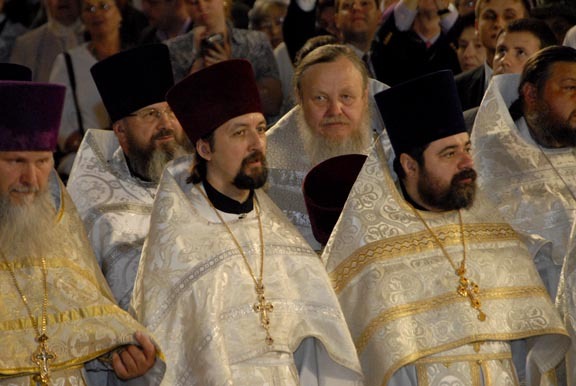 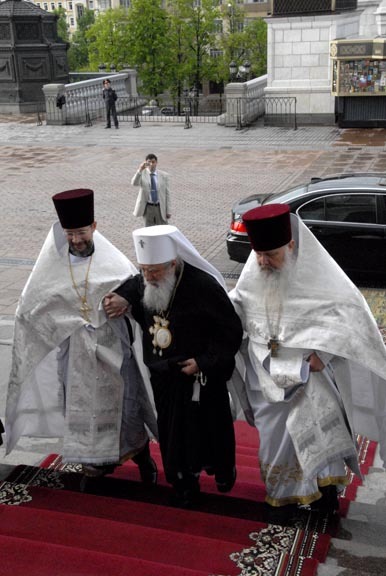 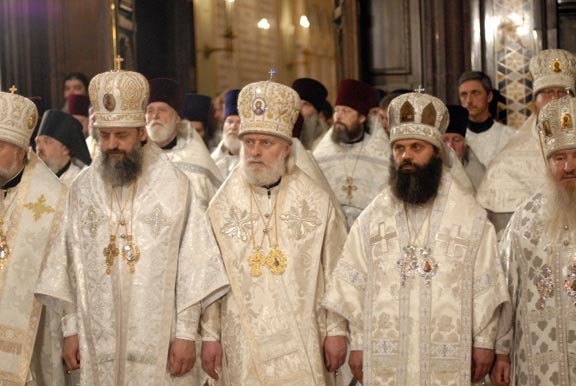 Eminent archpastors, beloved in the Lord fathers and children of the Russian Orthodox Church! 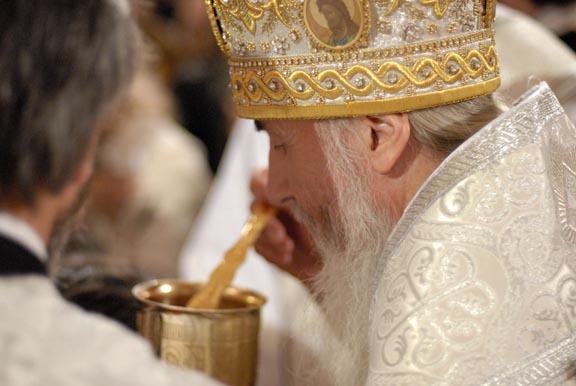 “The first word that Christ said to His followers after He rose from the dead was ‘Rejoice.' 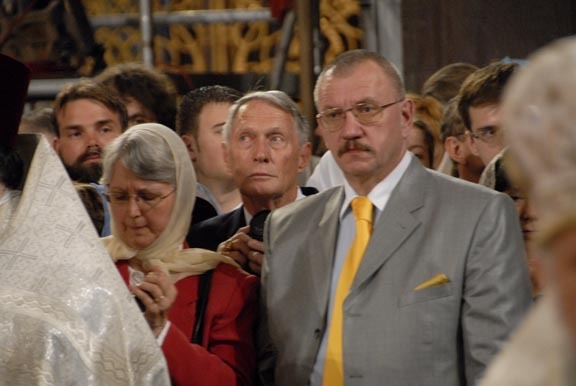 The second word that the Lord said to His disciples after the Resurrection was ‘peace be unto you.' 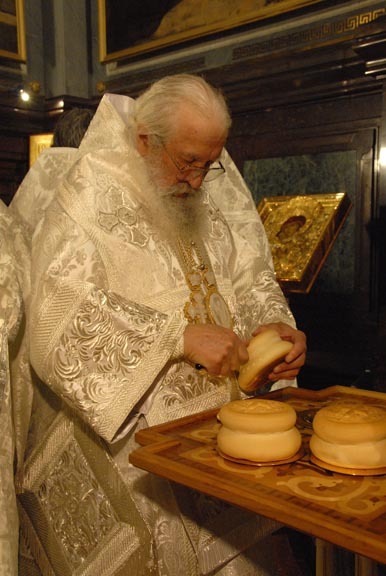 And so, on this holiday, we hear these greetings from the Ascended Lord, who granted us the joy of unity and blessed us with His peace. 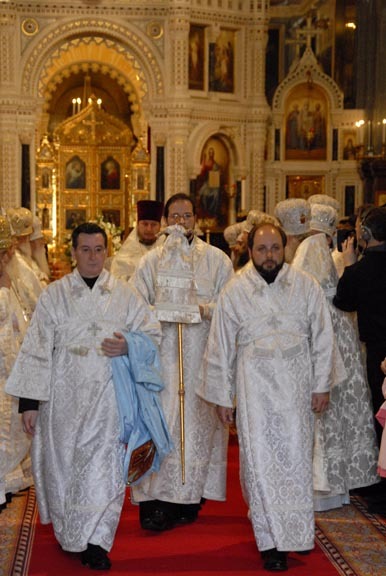 I congratulate all of you with this great joy! 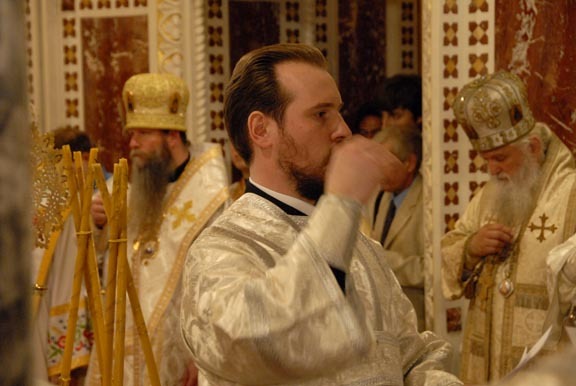 “First of all, I bring thanks to the great Chief Pastor, our Lord Jesus Christ, who gave us the strength to perform this great deed. 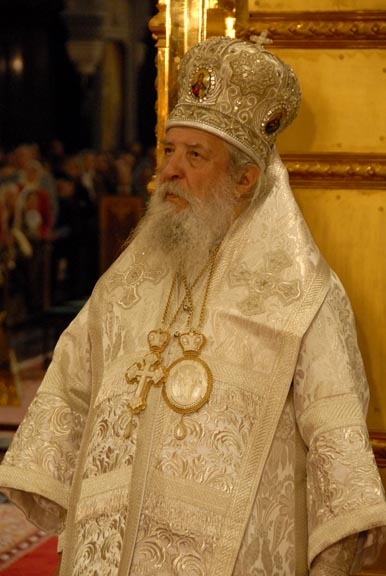 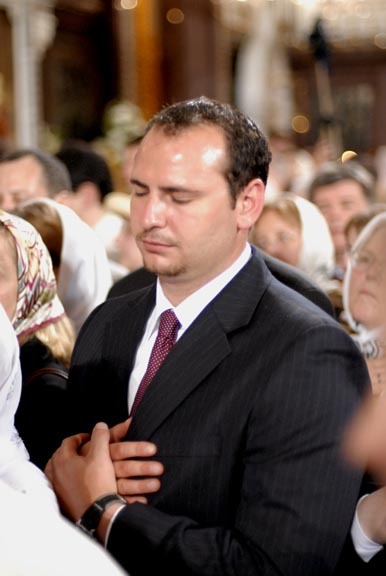 On behalf of my fellow-travelers and on my own behalf, I personally express to Your Holiness and Your Excellency the profound gratitude that fills our hearts and souls for the loving invitation to visit you, for your brotherly benevolence and hospitality, and I raise my prayers to the Altar of the All-Highest, that He send His Omnipotent help and heavenly blessing to your zealous labors for the glory of the Holy Church of Christ and our Russian people. 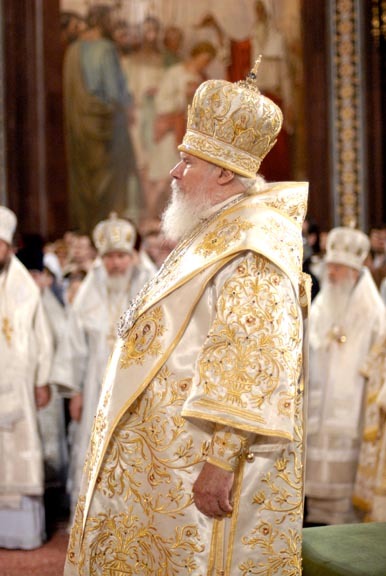 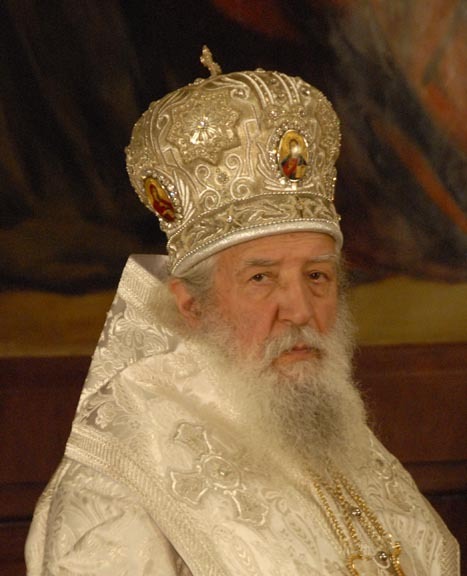 His Holiness then addressed the Chief of State of the Russian Federation, noting his participation in the work of reestablishing unity within the Local Russian Orthodox Church. 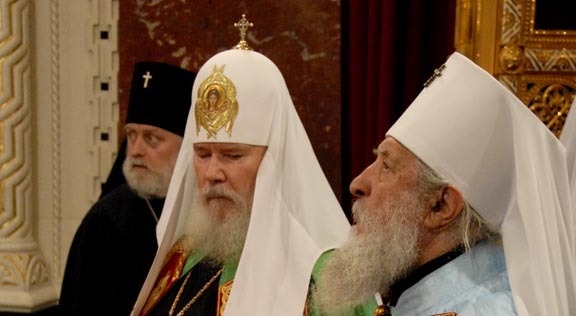 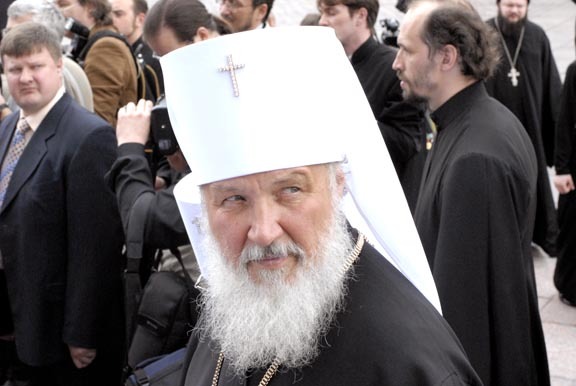 His Holiness reminded everyone that a few years ago, Vladimir Vladimirovich Putin, during a visit to New York, met with His Eminence Metropolitan Laurus and the members of the Synod of Bishops of the Russian Orthodox Church Outside of Russia. 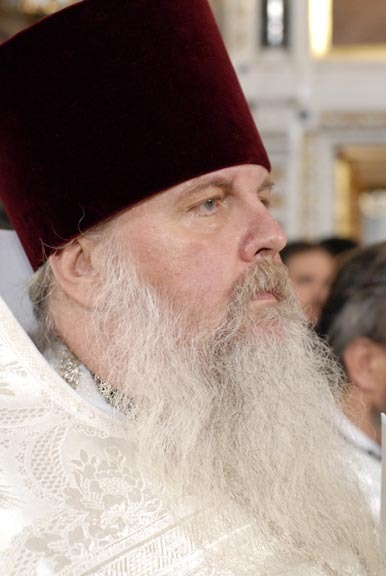 “In you they saw a person dedicated to Russia, an Orthodox Christian who serves his people,” said the Primate of the Russian Orthodox Church. 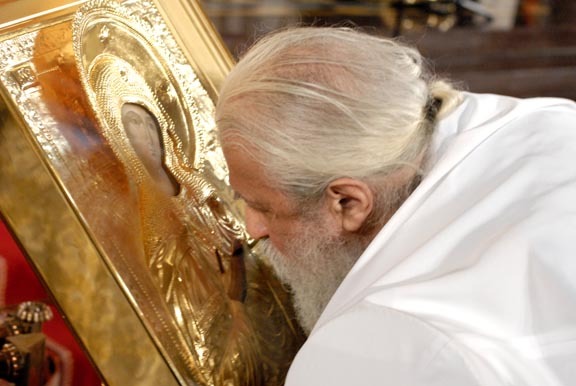 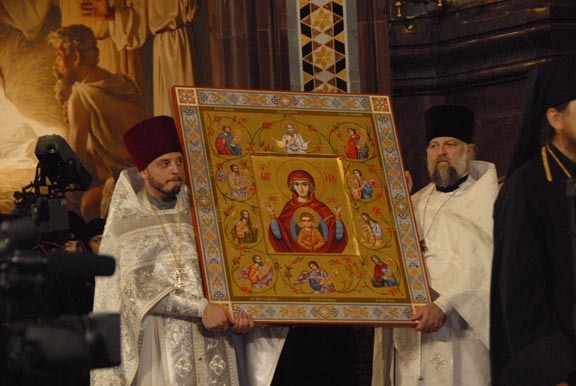 In memory of this event, His Holiness gave the President a triptych representing the Life-Giving Trinity, the Vladimir Icon of the Mother of God and the Icon of the Host of New Martyrs and Confessors of Russia. 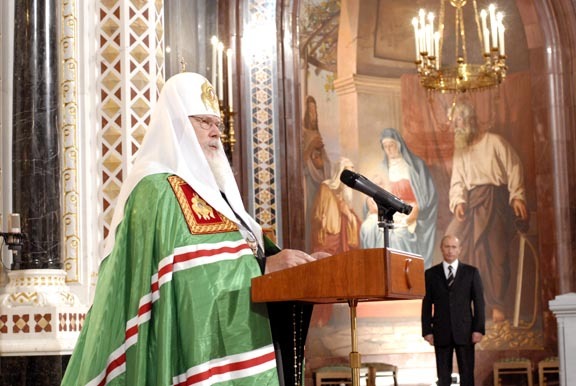 The Russian President then addressed those present. 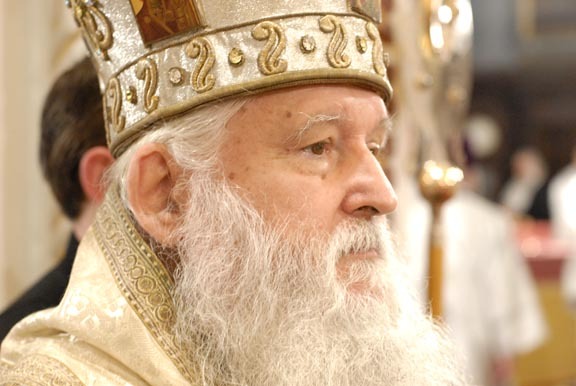 He said that the signing of the Act of Canonical Communion is an epochal event not only in the history of the Church but in the life of society in general. 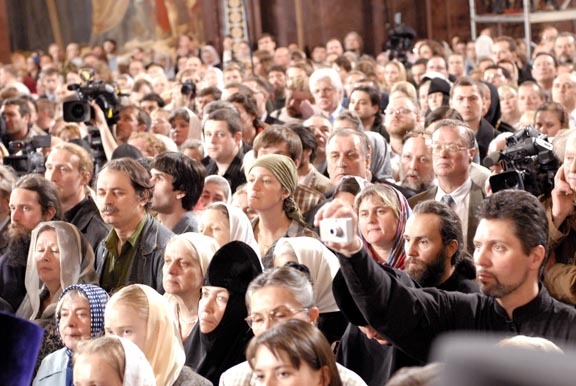 This event places an end to the division of the Church in the Fatherland and abroad. 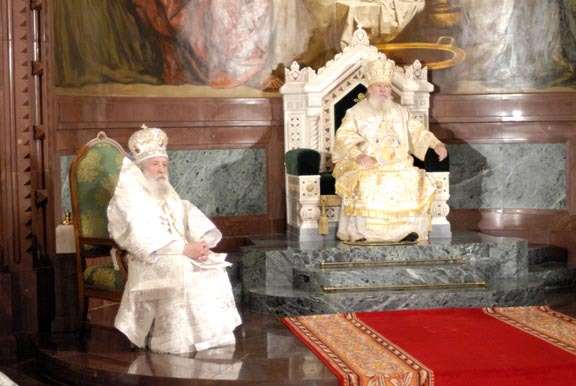 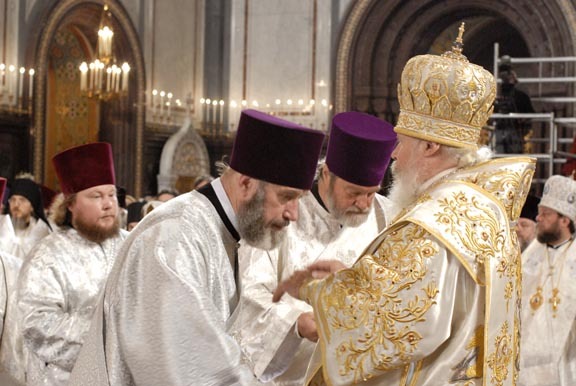 After the signing of the Act of Canonical Communion, a solemn Divine Liturgy began, at the end of which His Holiness and His Eminence exchanged greetings. 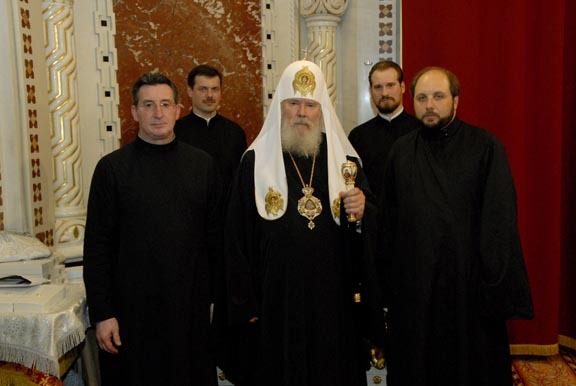 After Liturgy followed the opening of an exhibition on the recent history of the Russian Orthodox Church, the New Martyrs and Confessors of Russia and the discussions on reconciliation that led to the restoration of brotherly communion and the unity of the Local Russian Orthodox Church. 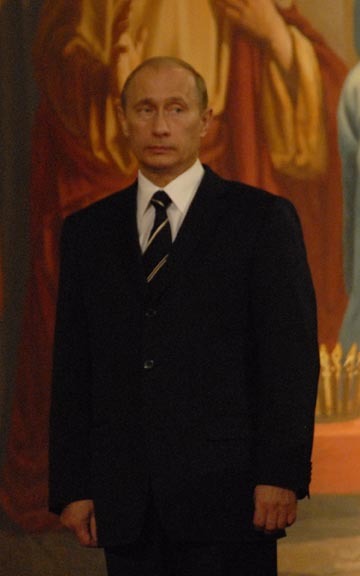 A trapeza then followed. 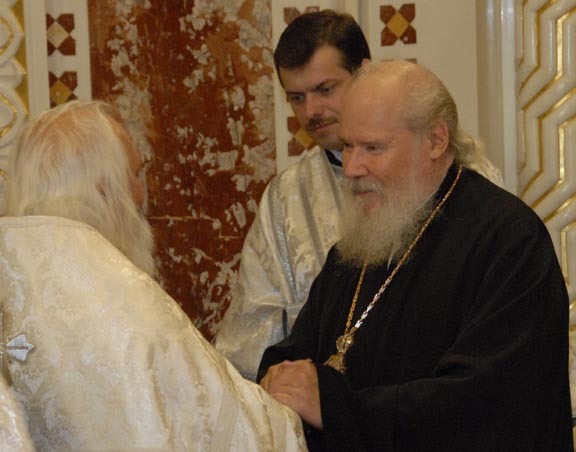 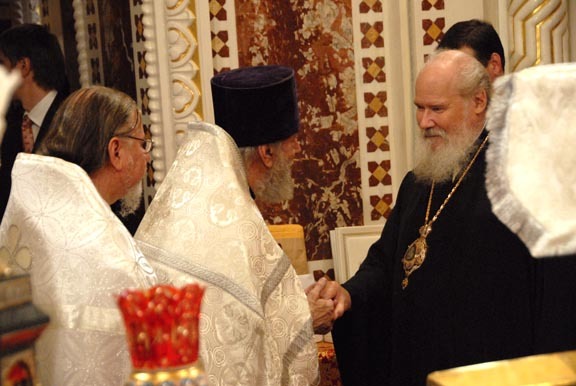 That evening, His Eminence Metropolitan Laurus met with the participants of the Church History Conferences held in 2001 and 2002, and others who helped in the great work of the unity of the Russian Orthodox Church.